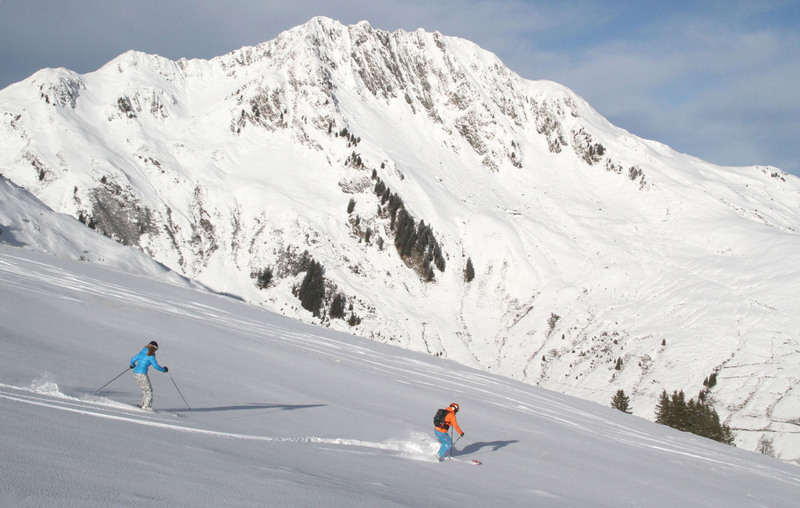 Skiing in Austria’s Alps is astounding. 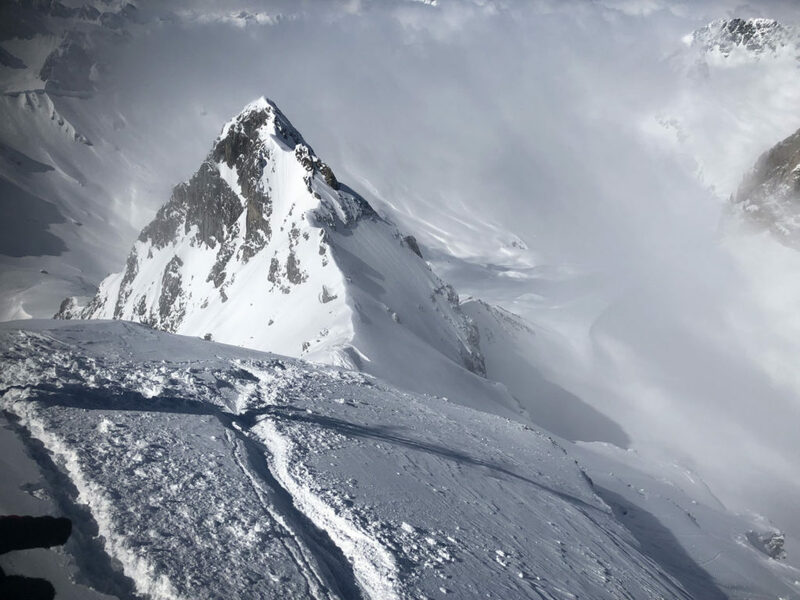 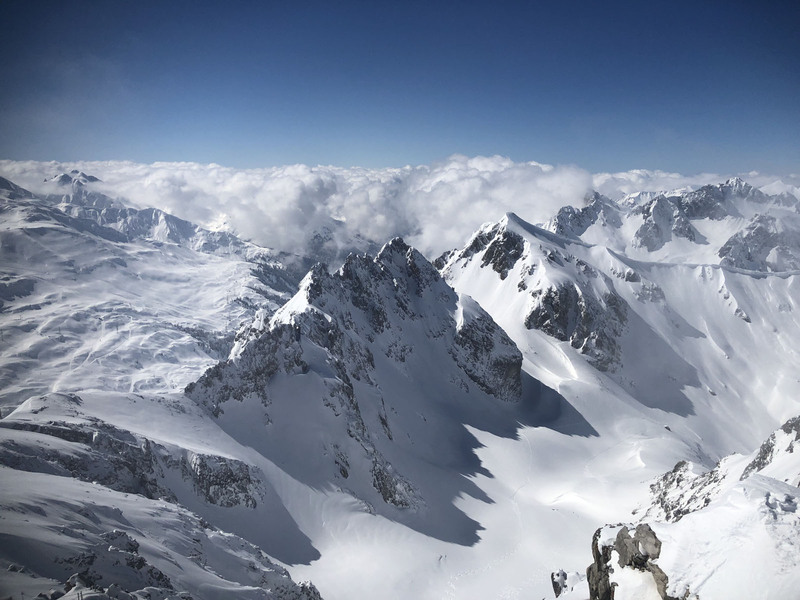 Towering 10,000-foot (3,000 meter) peaks covered in snow stretch as far as you can see, views toGermany, Switzerland and Italy, with Austria as the heart of it all. 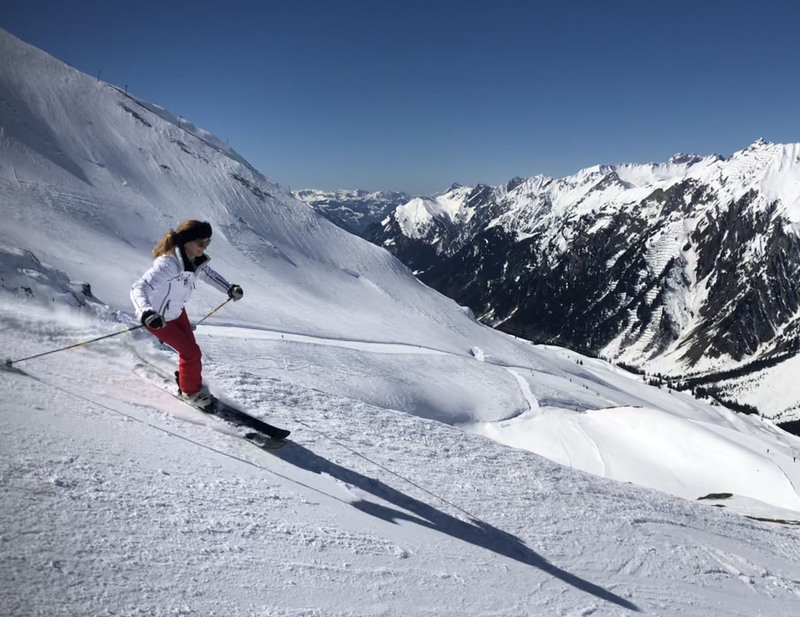 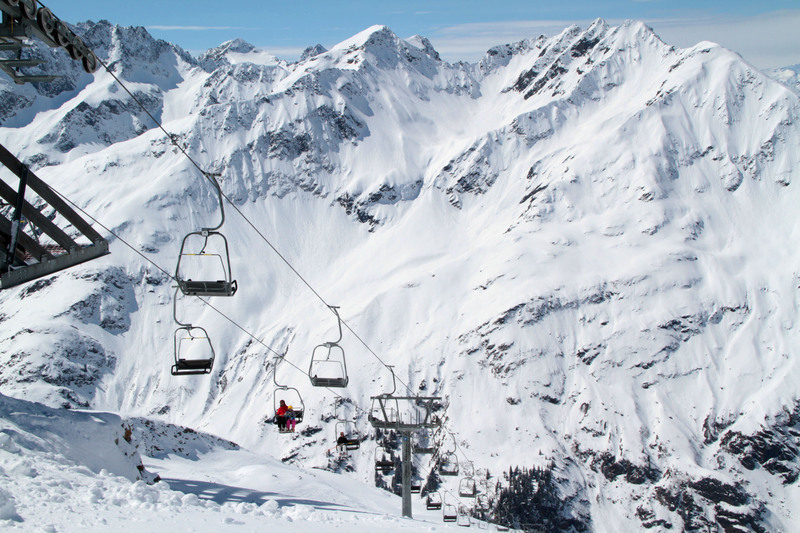 The Zillertal, Tyrol, Voralberg and Salzburg regions are laden with ski mountains – many of which are interconnected. 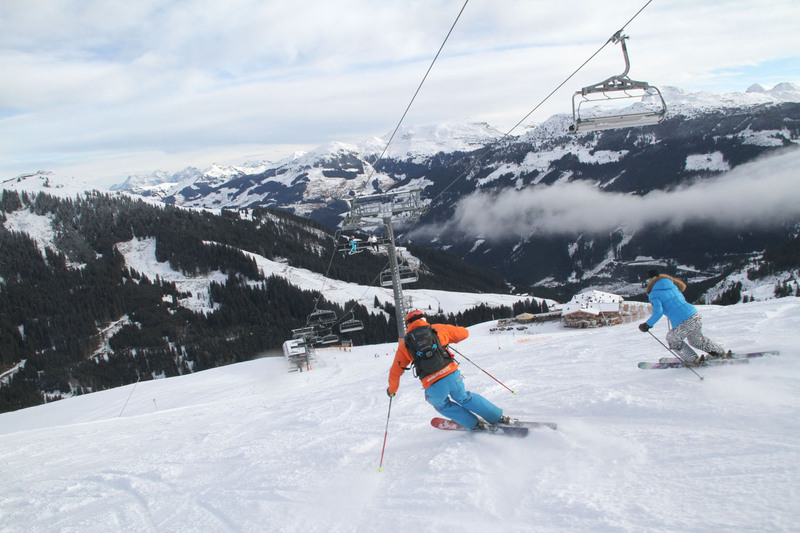 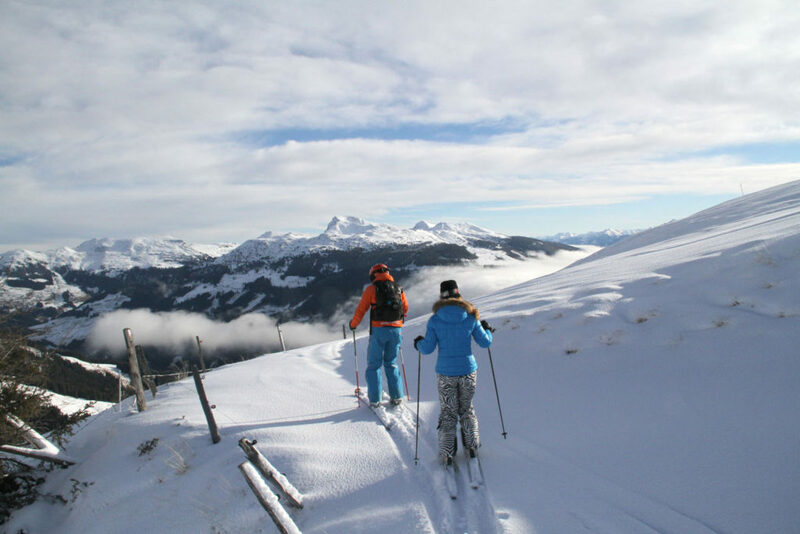 You can ski from Kitzbühel to SkiWelt in a 100-kilometer ski safari in a day. 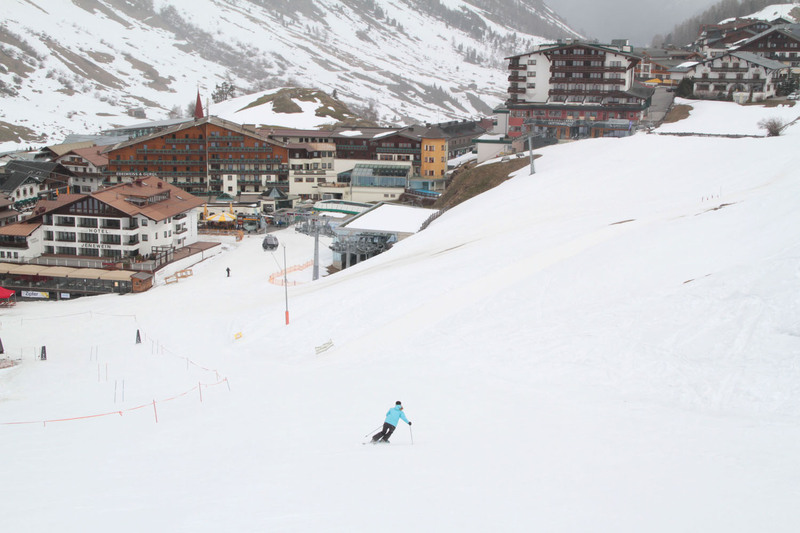 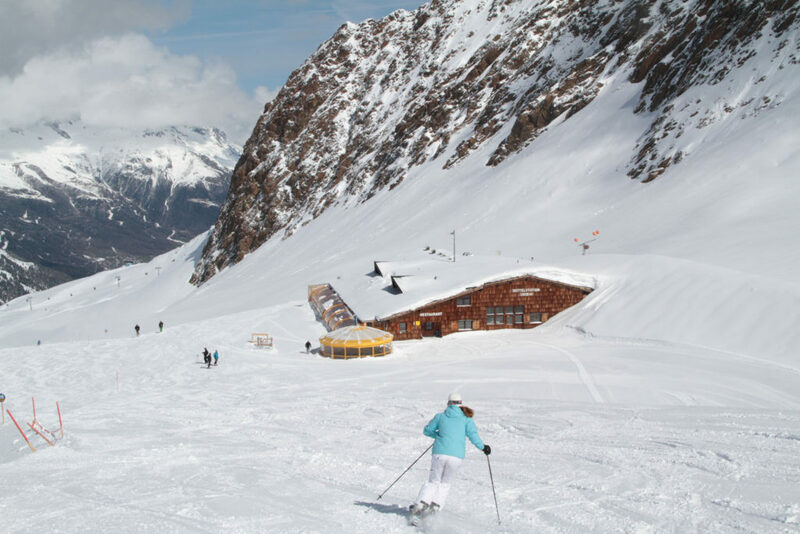 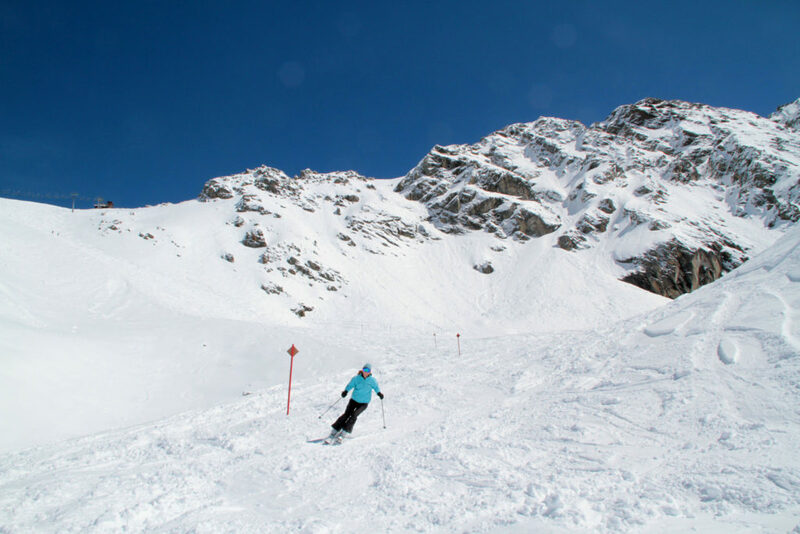 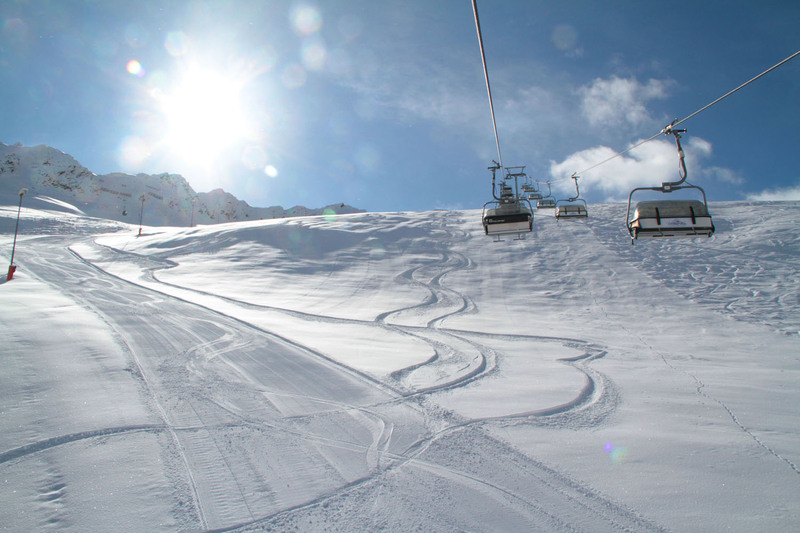 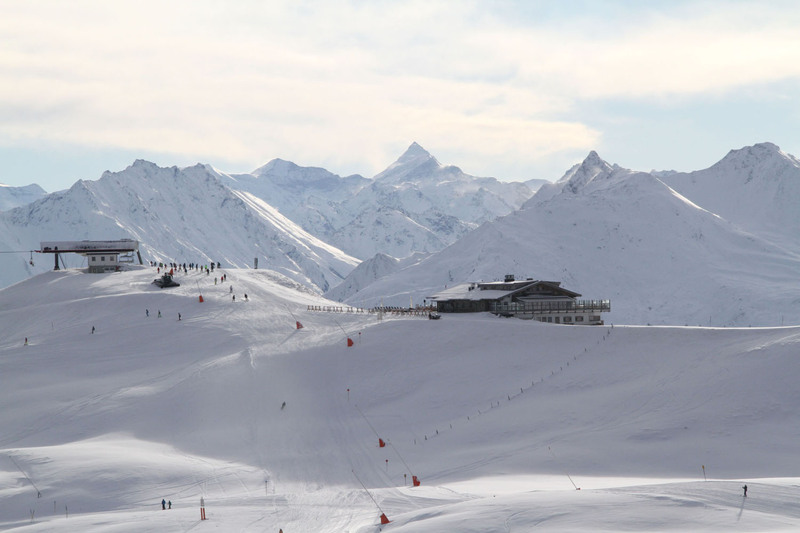 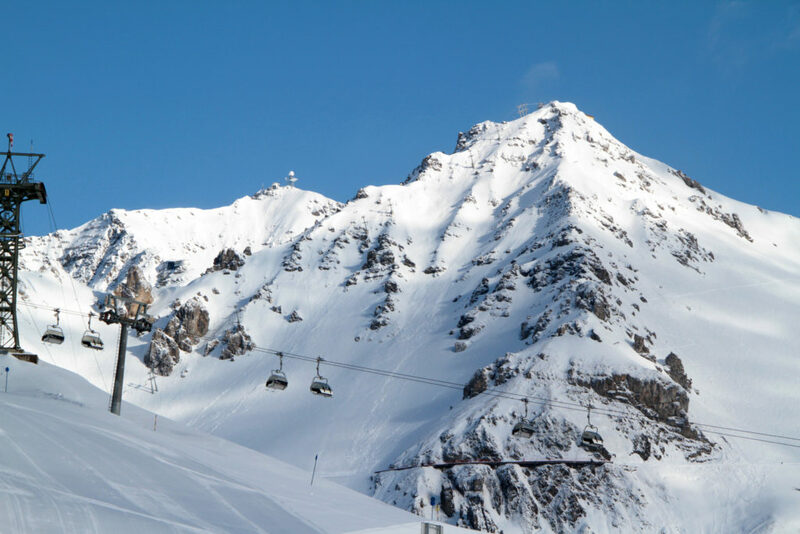 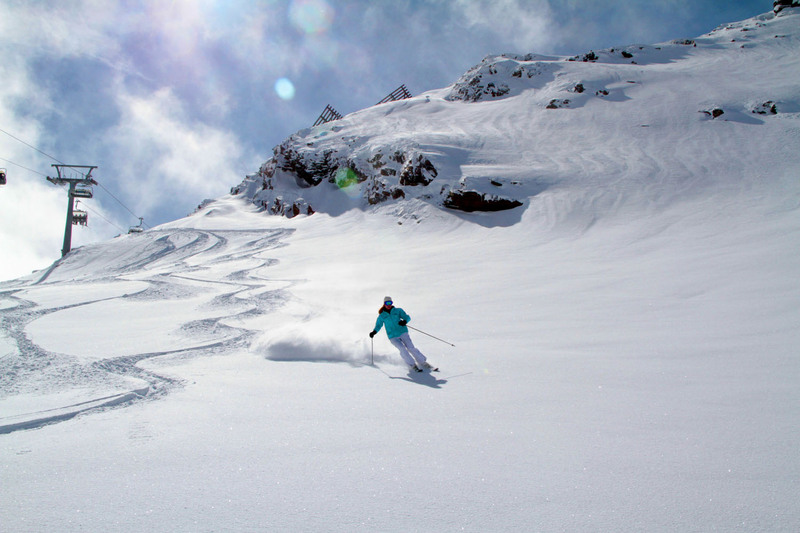 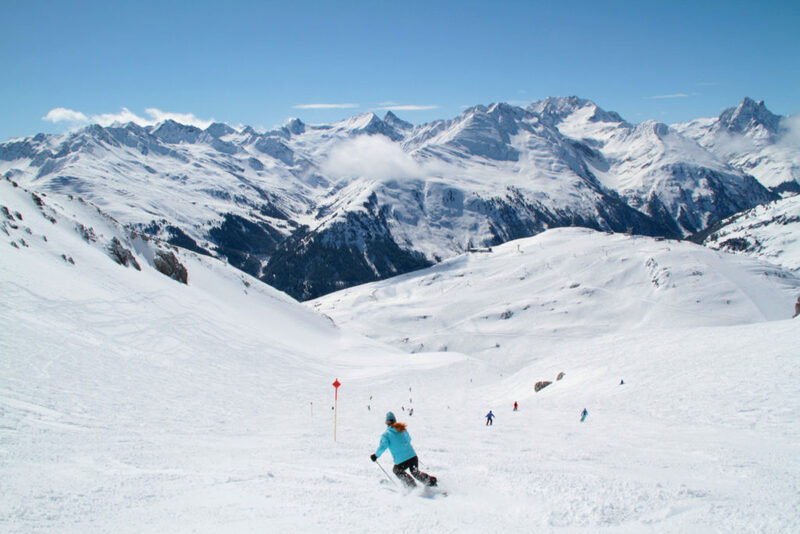 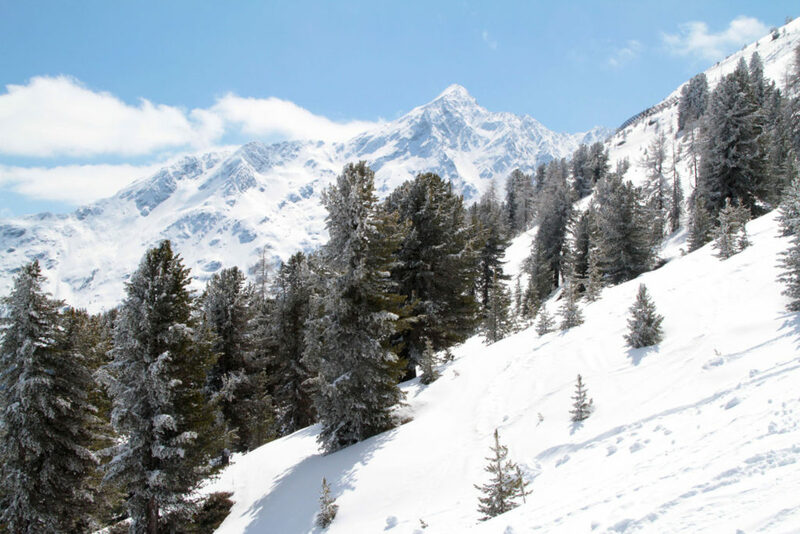 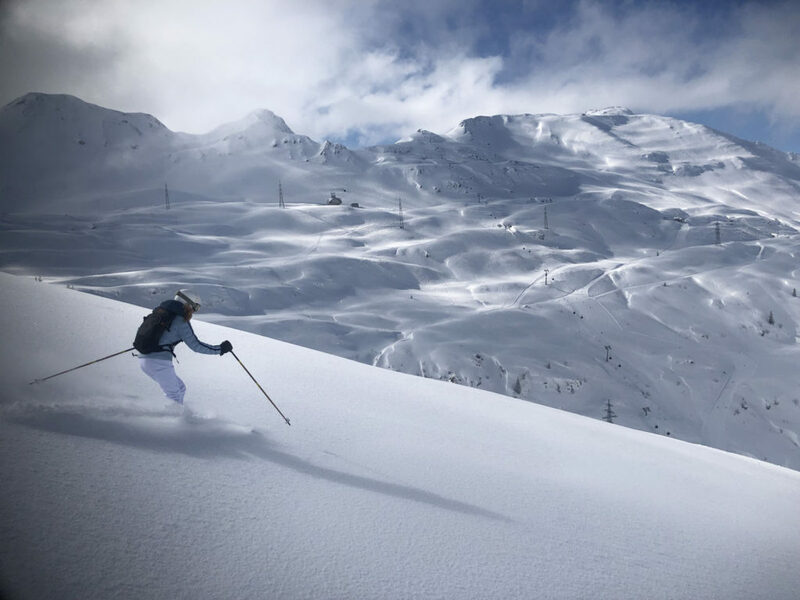 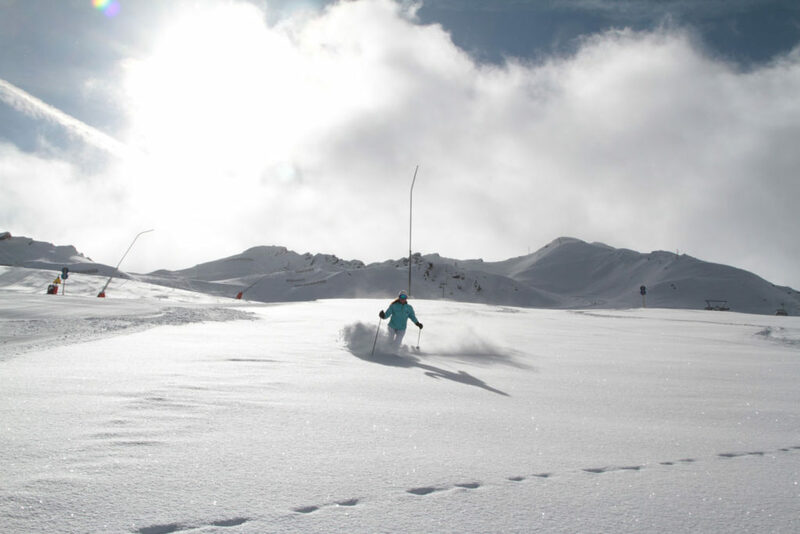 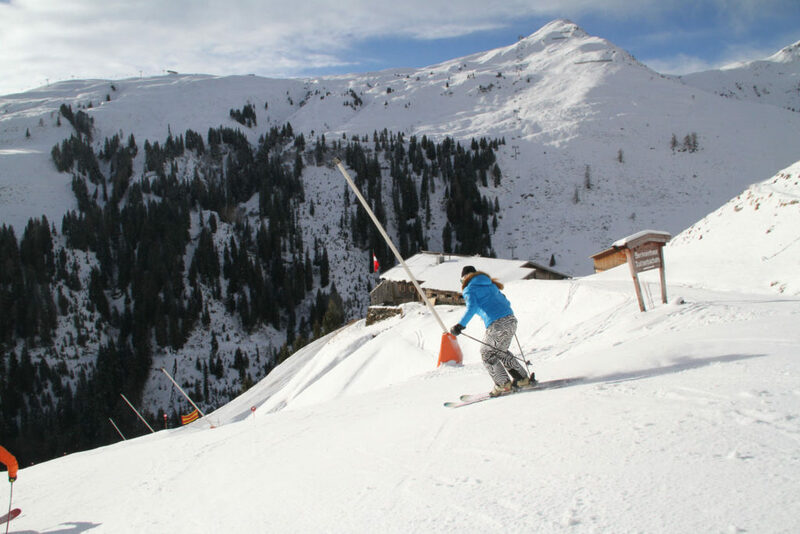 The Arlberg is Austria’s largest with 88 lifts and 305 kilometers of ski trails. 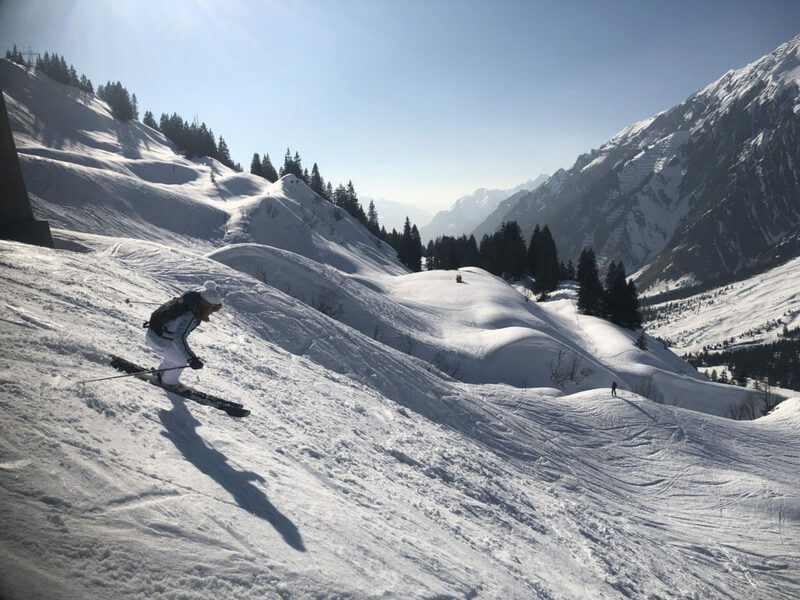 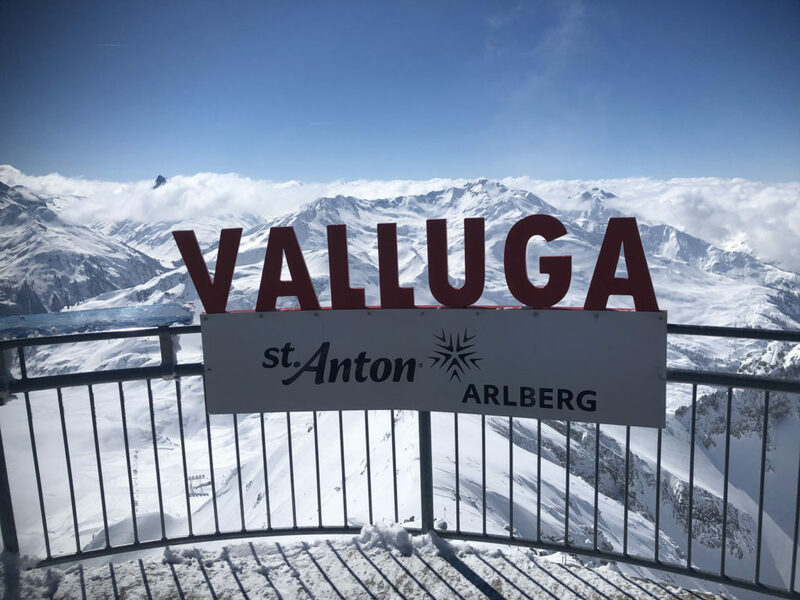 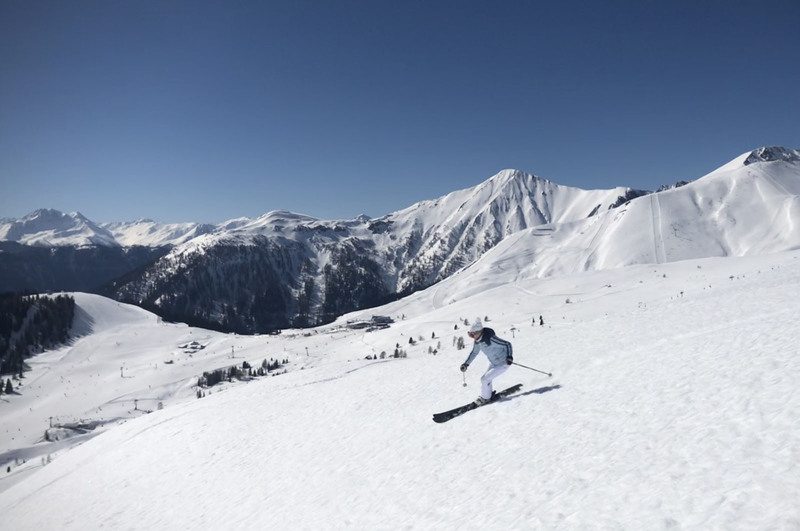 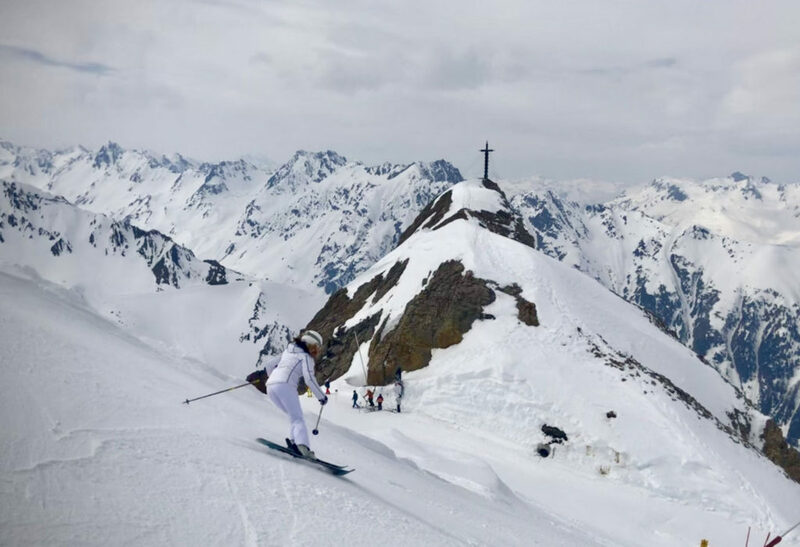 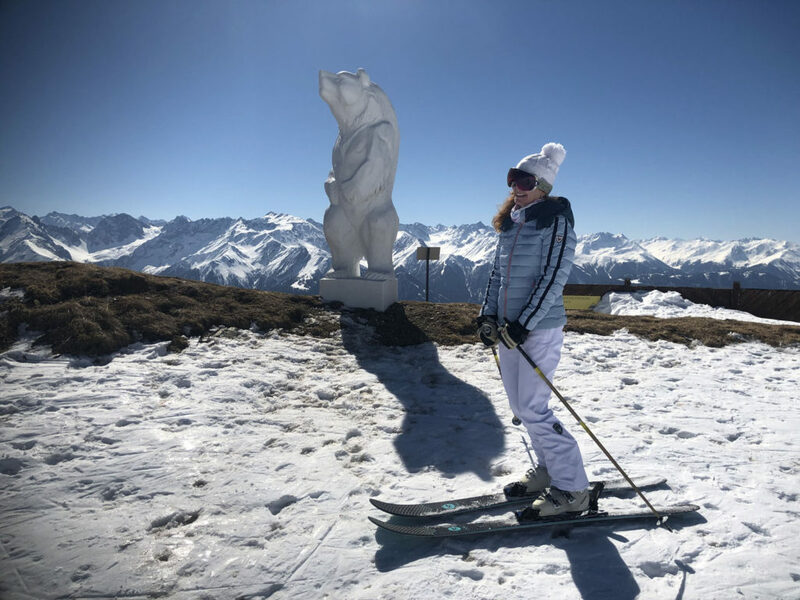 Austria is home to many of the top ski resorts in the world, Kitzbühel, The Arlberg’s St Anton, Stuben, Lech, Zurs, Ischgl, Innsbruck, Mayrhofen- Zillertal, Solden, SkiWelt… the list goes on . 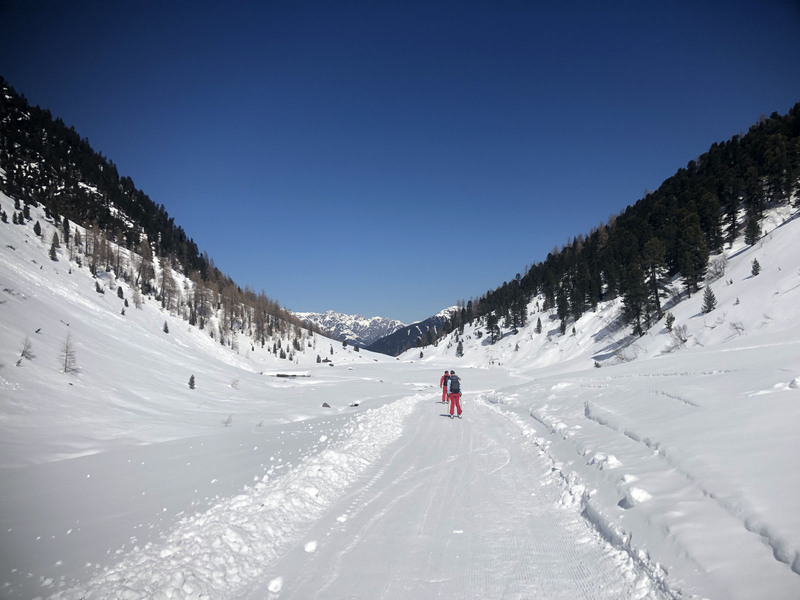 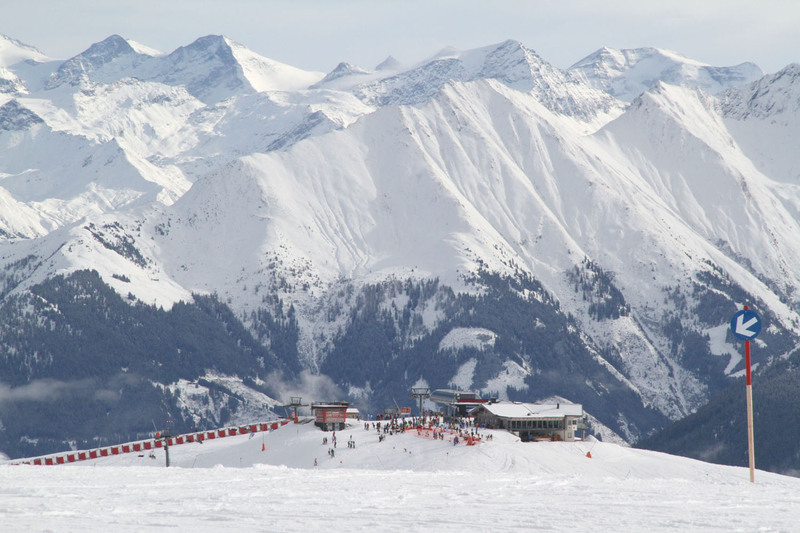 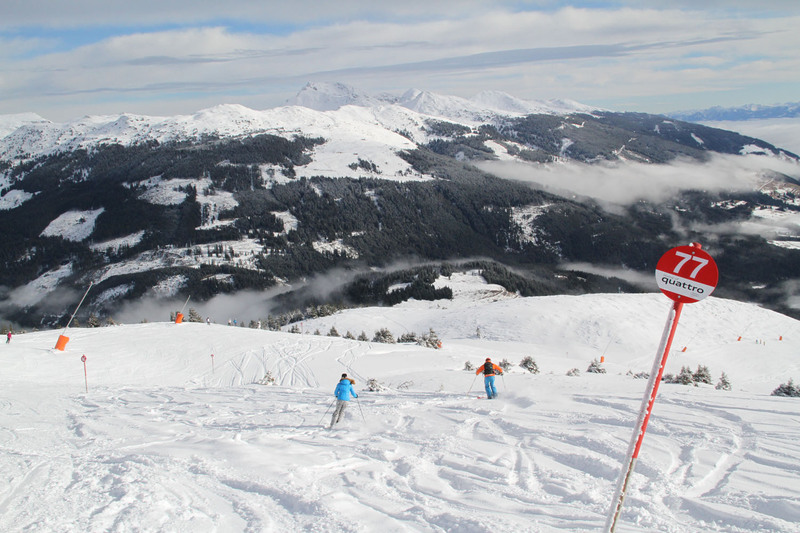 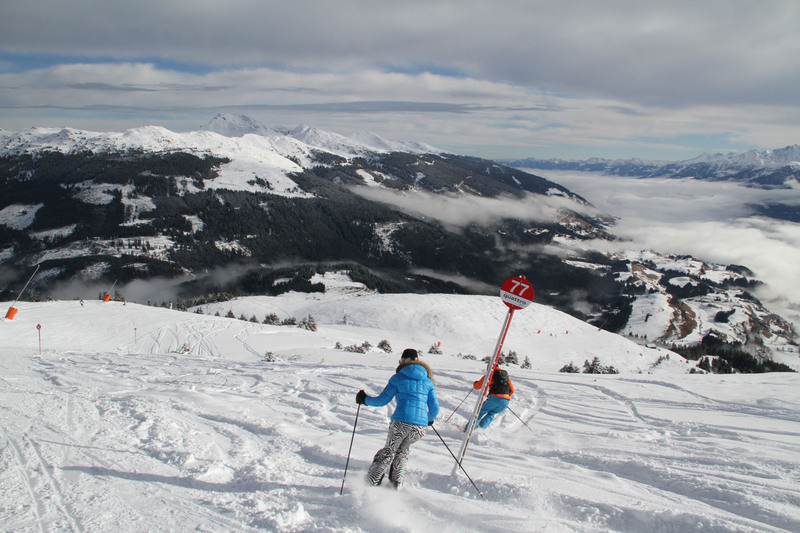 There are over 400 ski areas in a country about the size of Maine, over 80 just in the Tyrol. 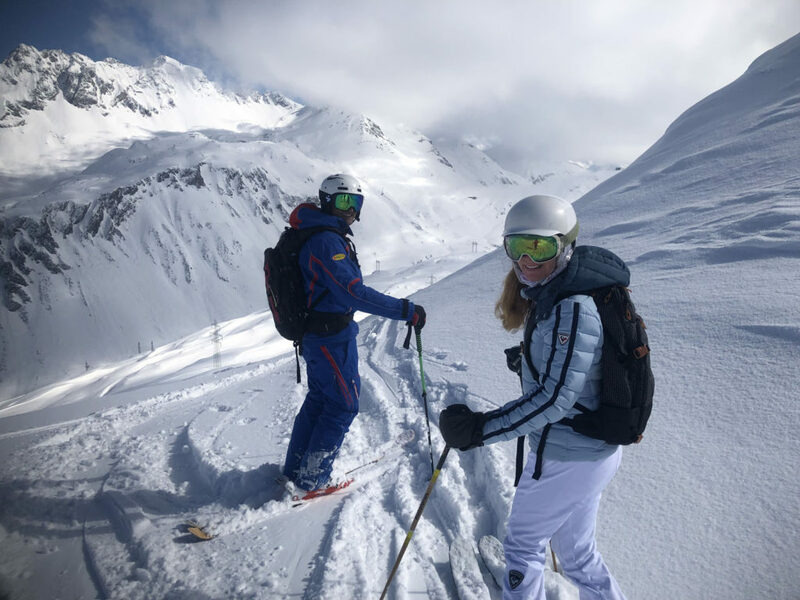 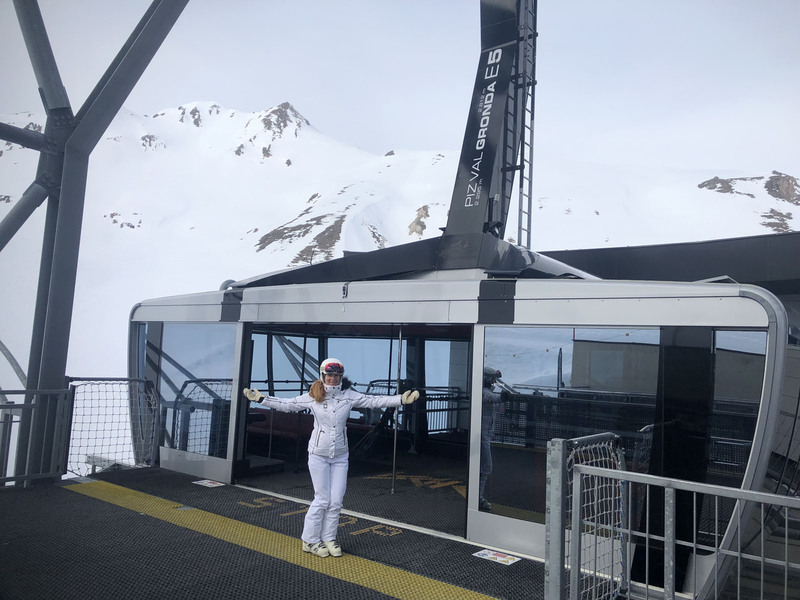 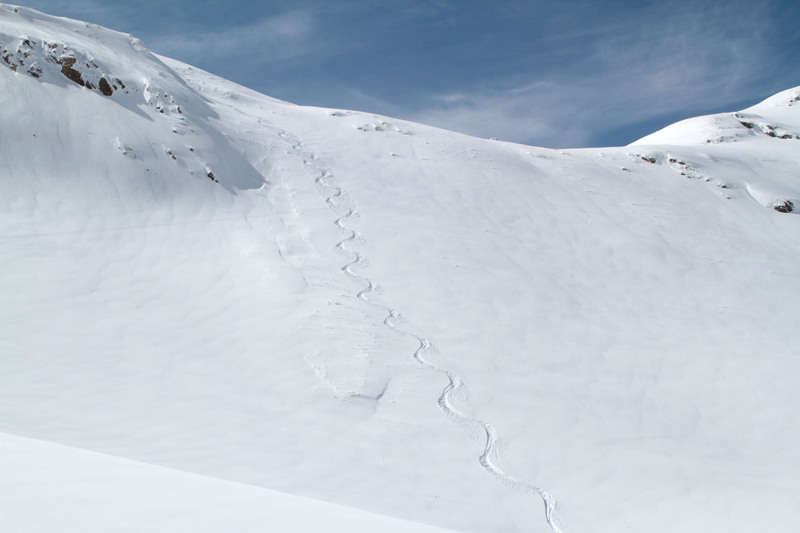 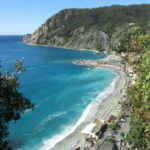 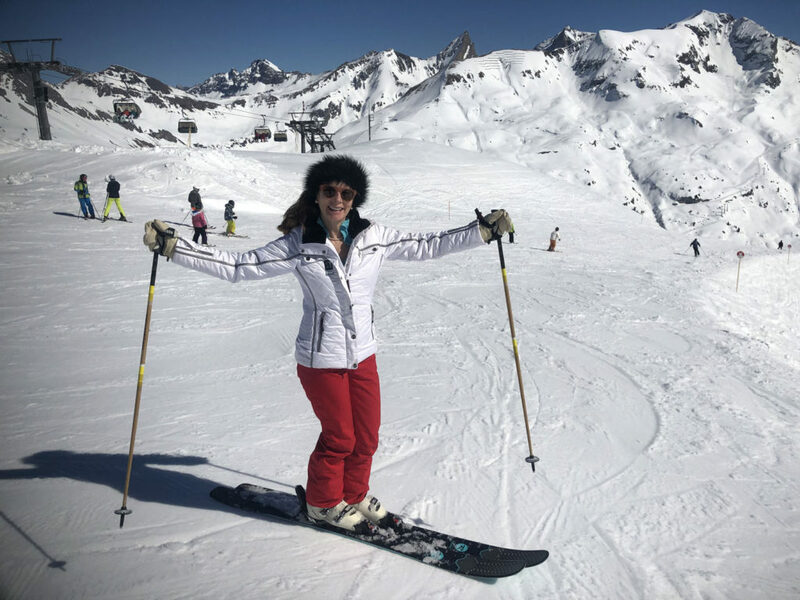 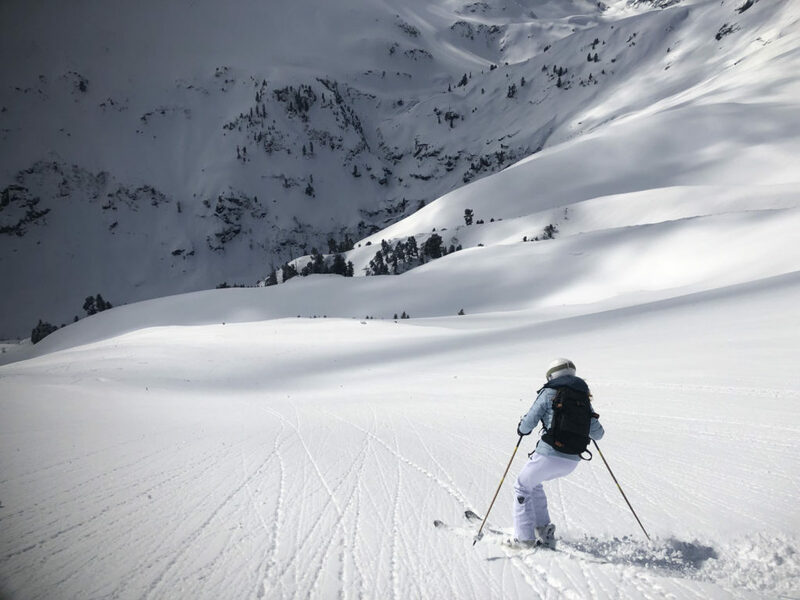 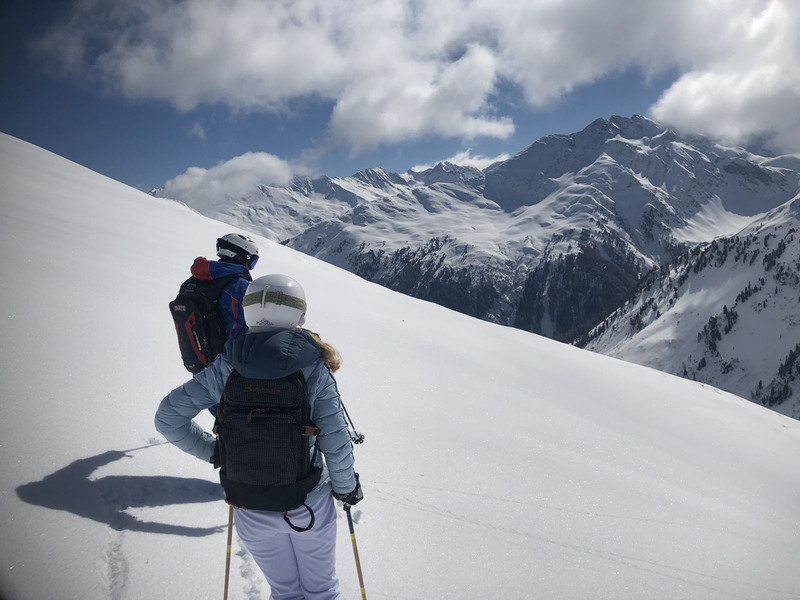 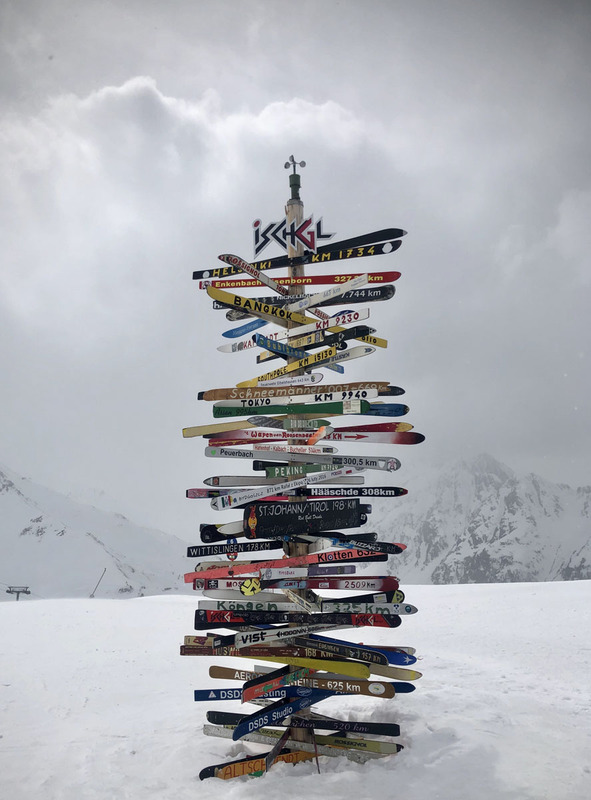 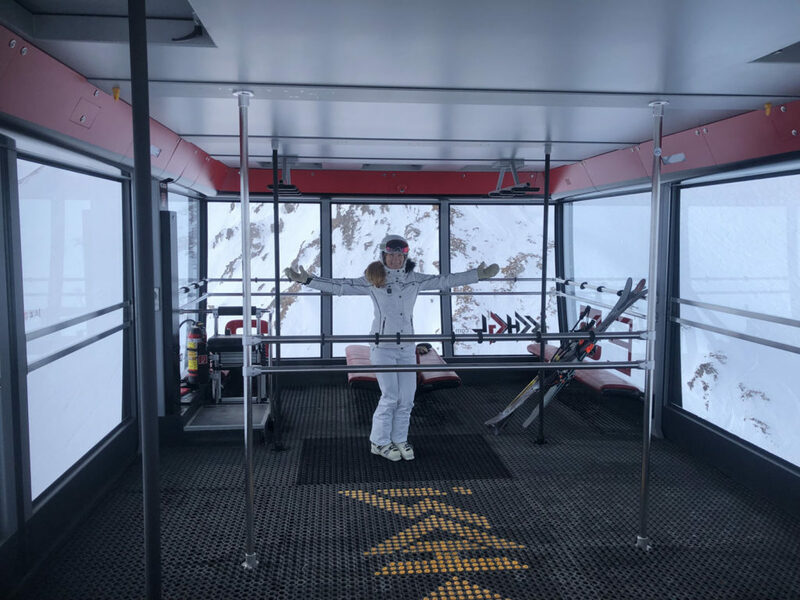 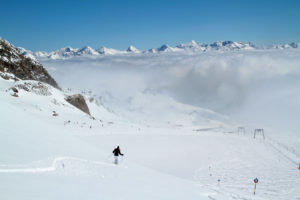 You can easily tour several ski resorts in one visit, since one is often 20 minutes from the next if not interconnected. 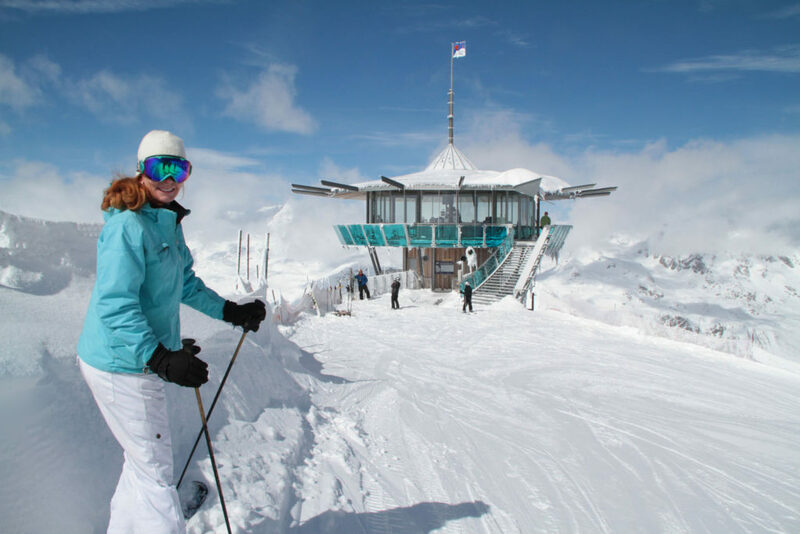 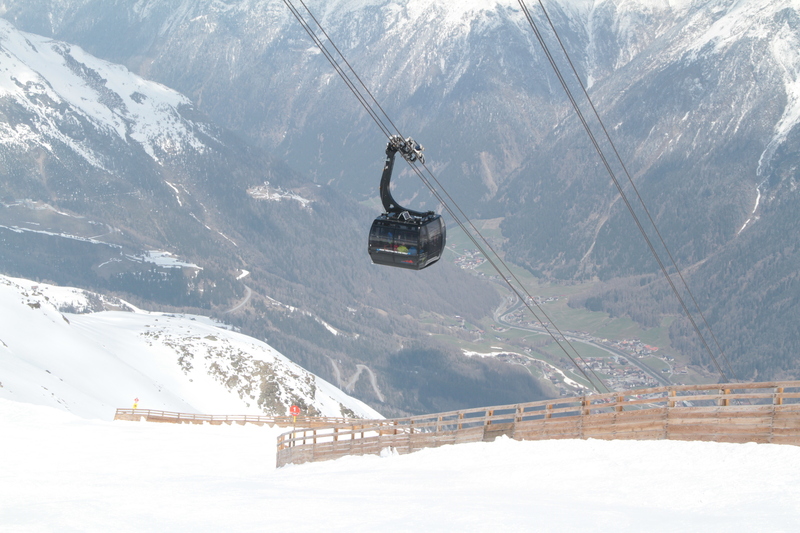 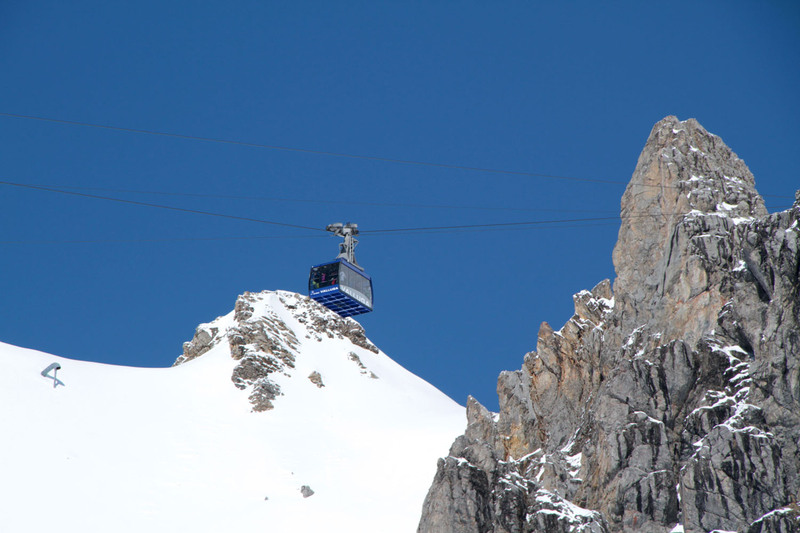 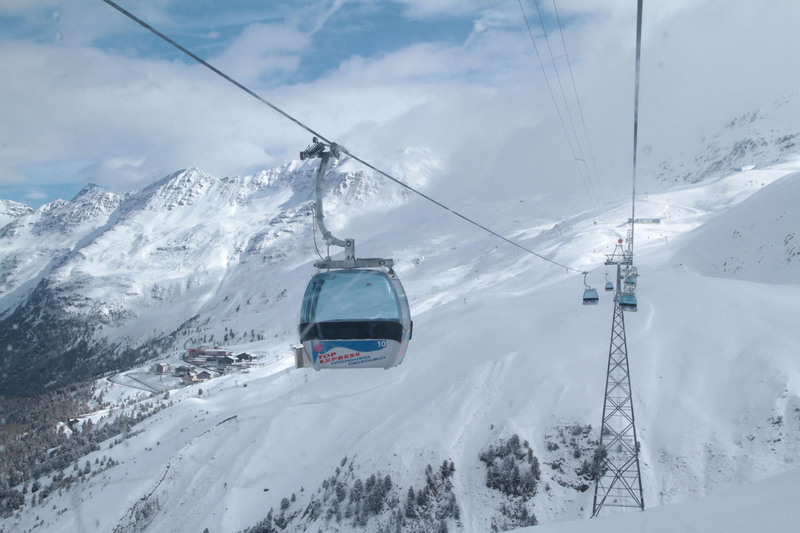 Austria is a playground for lift designers, home of Doppelmayr. 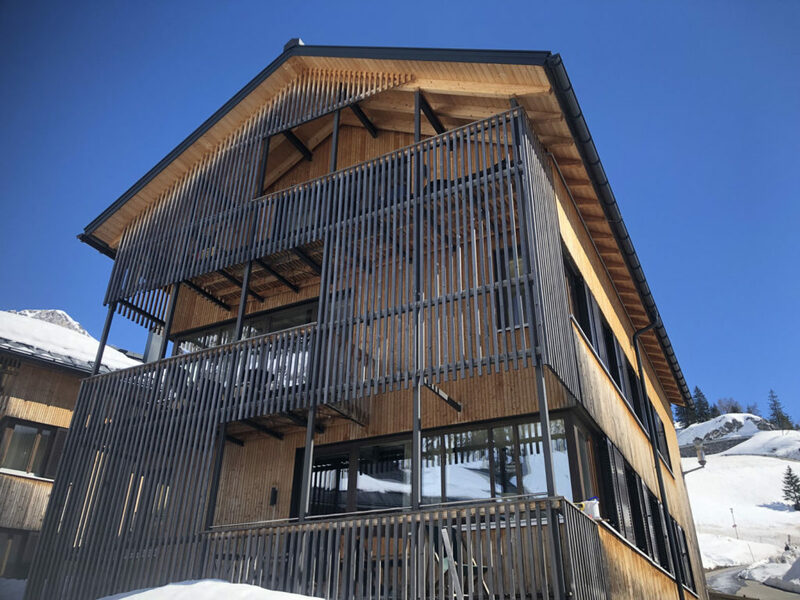 No expense appears spared and no peak is unreachable – the engineering is jaw-dropping. 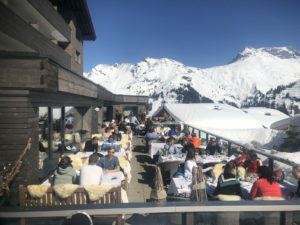 We rode in the ultimate $50 million gondola at Mayrhofen in Zillertal, with spectacular floor to ceiling windows, Wi-Fi and heated seats for 24 , which swiftly and scenically delivered us up 3,700 vertical feet in 8-minutes (no time to check my Facebook on the free Wi-Fi- distracted by the view). 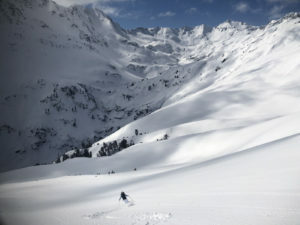 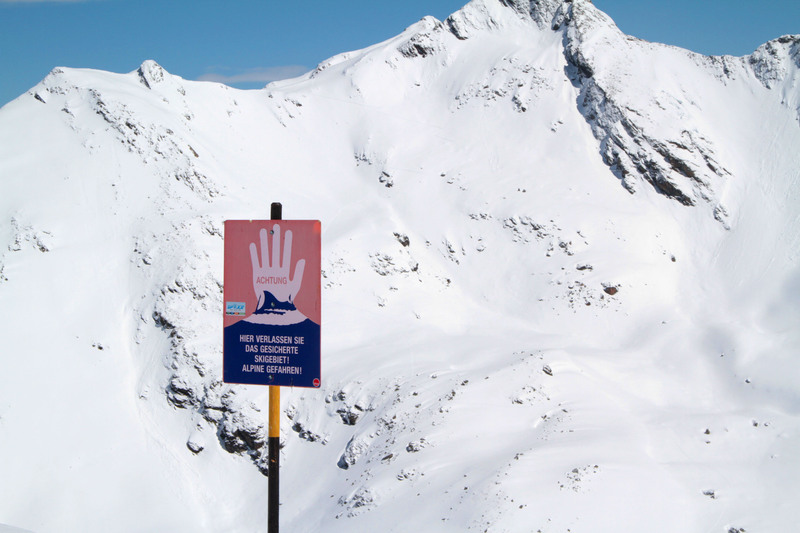 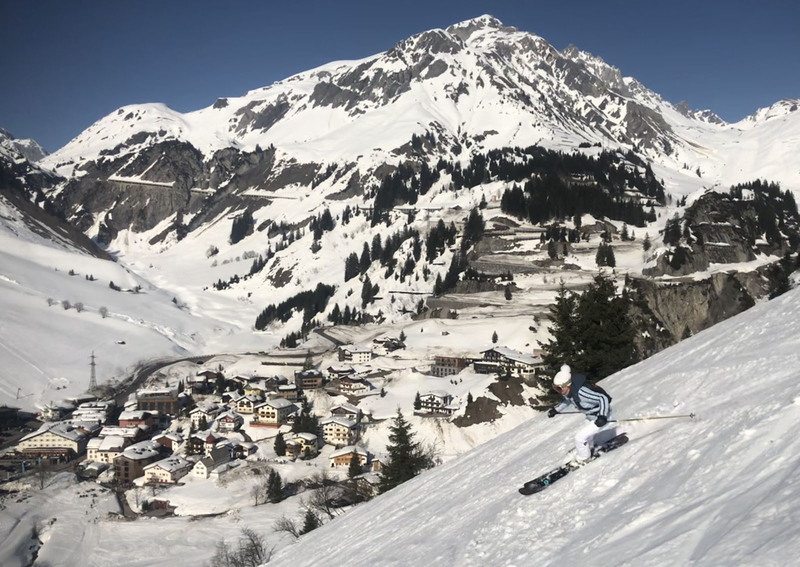 The Arlberg’s impressive Flexen and Triptkopf seamlessly connect Stuben to Lech Zurs. 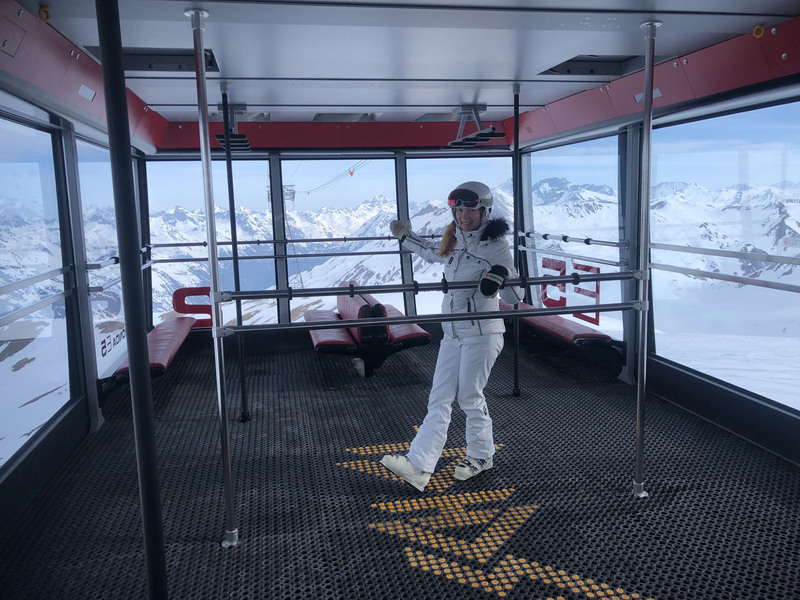 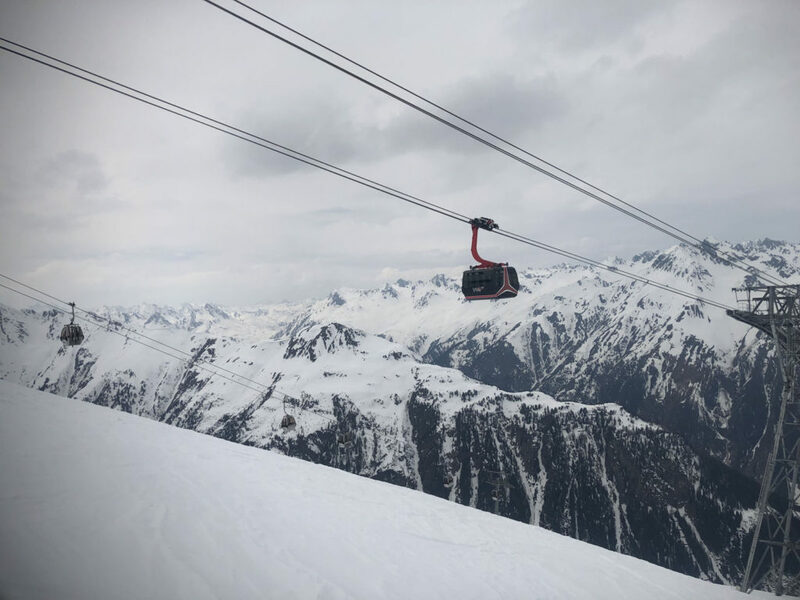 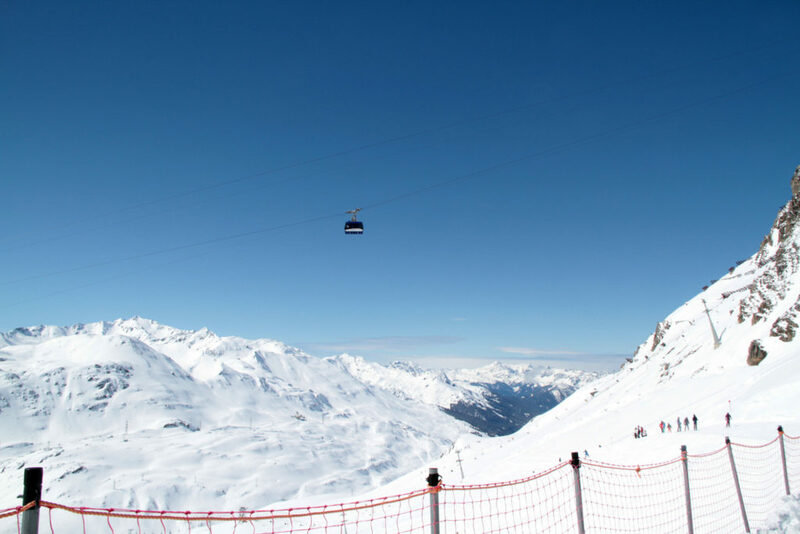 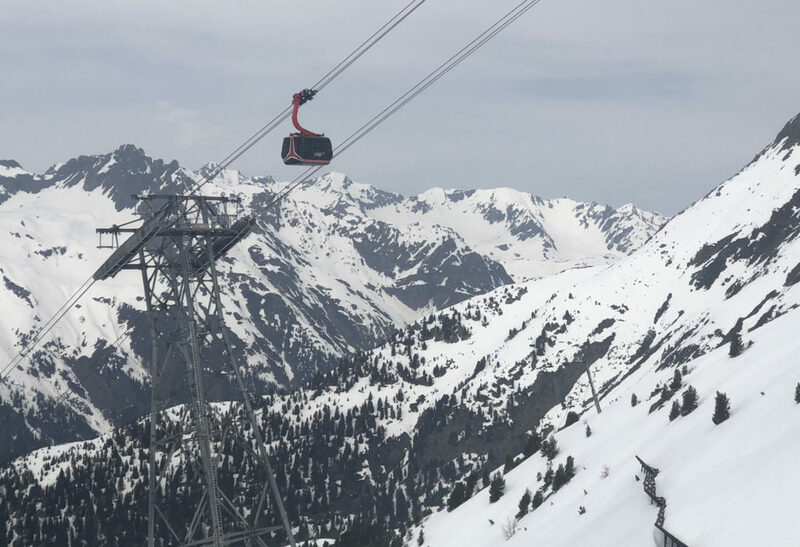 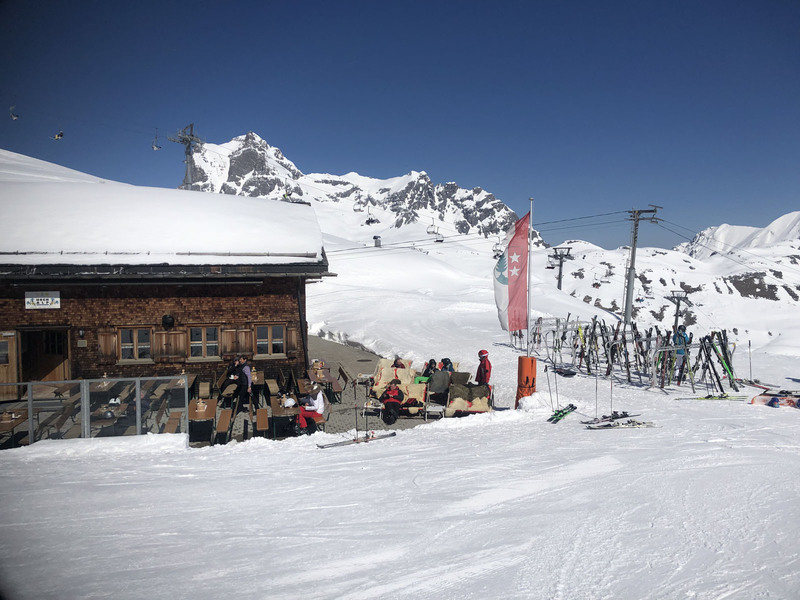 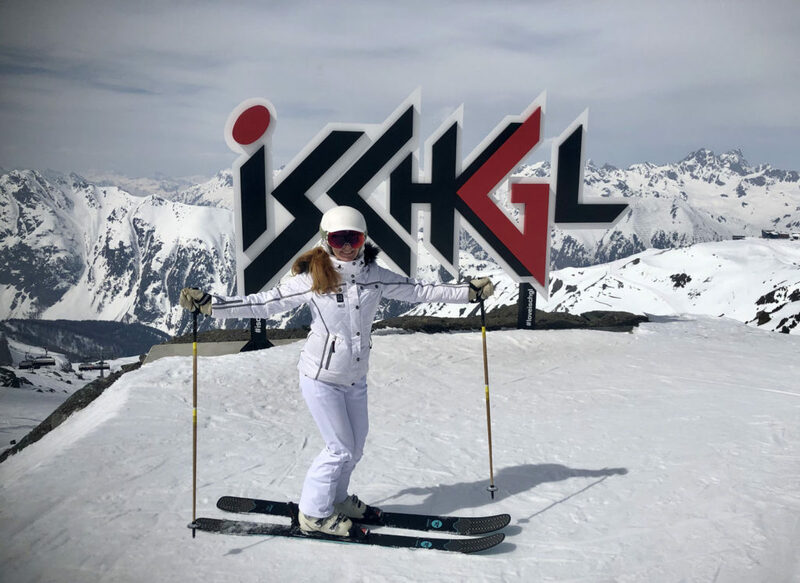 Ischgl’s numerous eight-passenger bubble-covered chairs are the lap of luxury between long gorgeous runs, black leather designer seats embroidered with heat – of course. 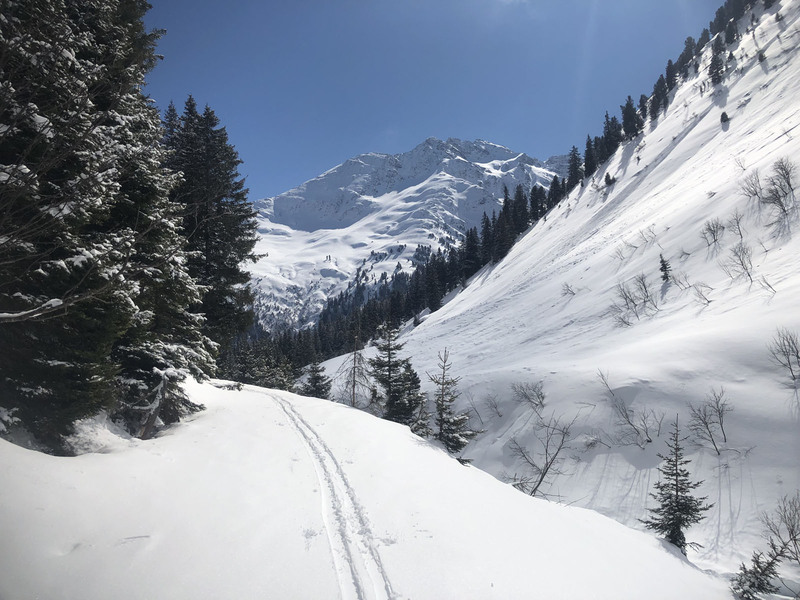 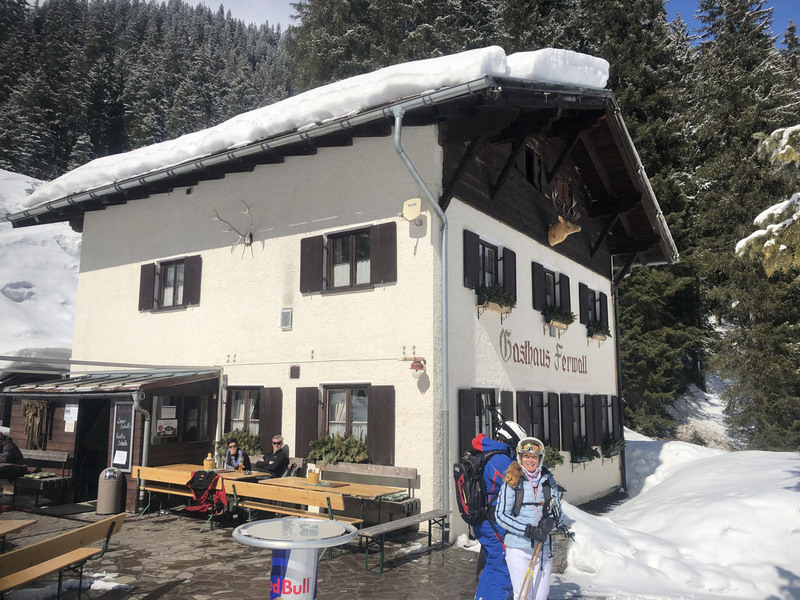 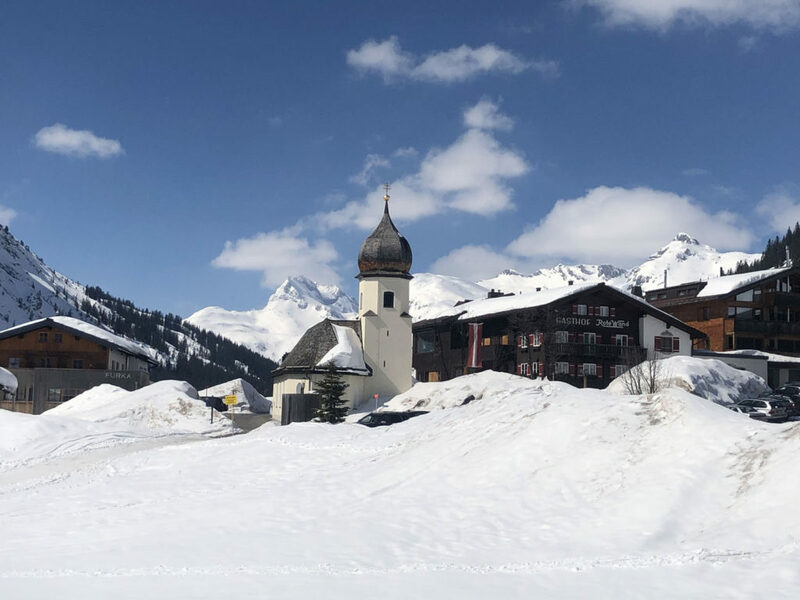 The skiing in Austria seems endless, hundreds of miles of prepared pistes (translation: groomed trails) plus limitless off-piste bowls and snowy valleys, but you are never very far from a charming mountainside chalet. 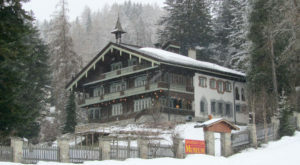 Kitzbühel has 77 huts serving authentic Tyrolean recipes. 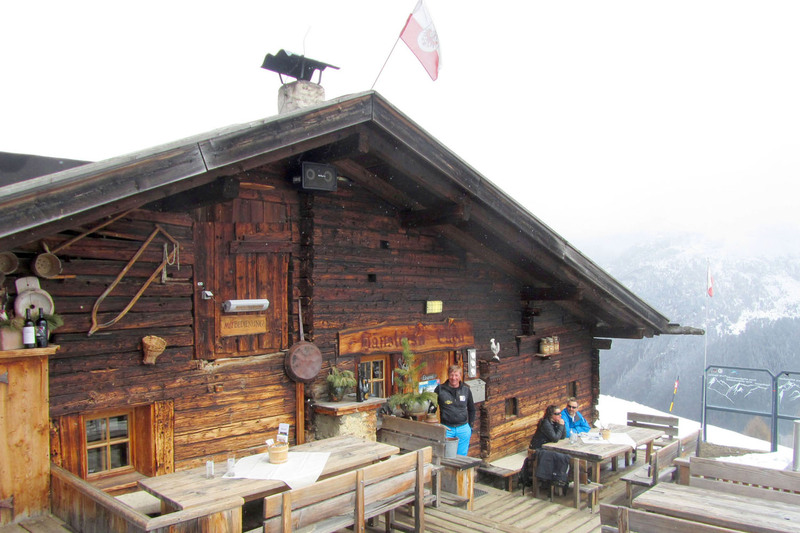 The most famous Rubezahl Alm dates back to 1778 as evidenced in the low wooden doors. 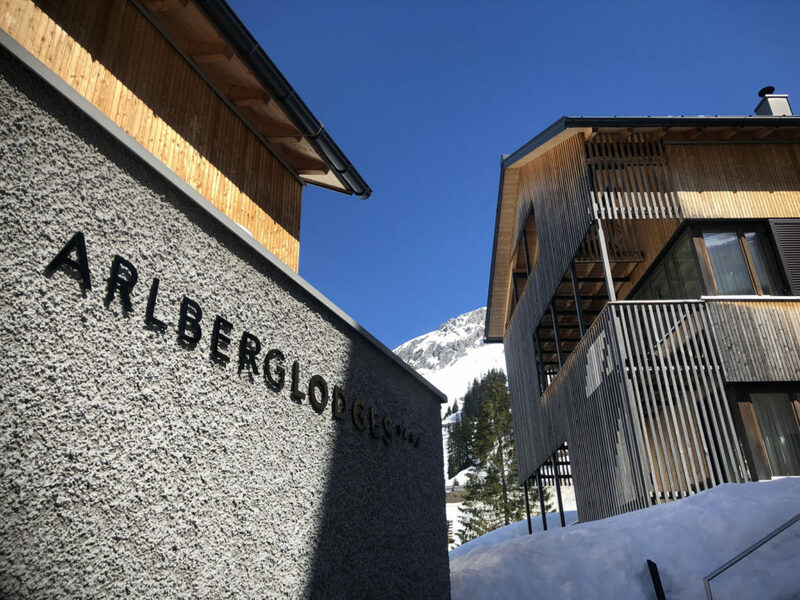 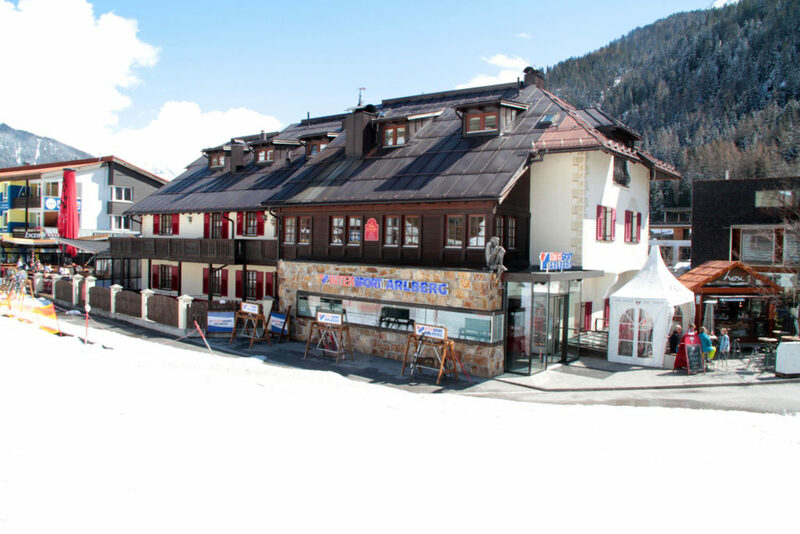 The Arlberg has modest old chalets to chic alpine lodges in St Anton, Stuben and Oberlech. 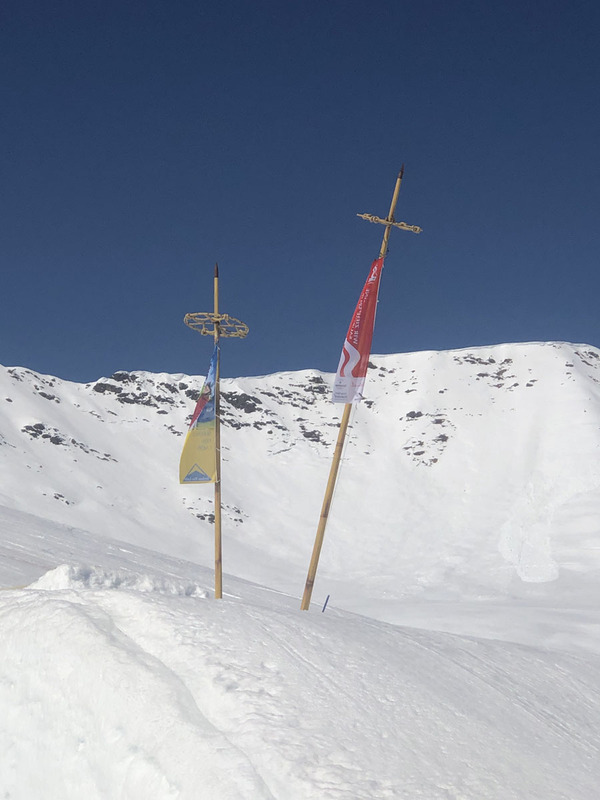 Look for the flag flying at centuries old high alpine farm houses indicating they are open for lunch, or a schnapps, served by the very farm families who graze their cows here in summer. 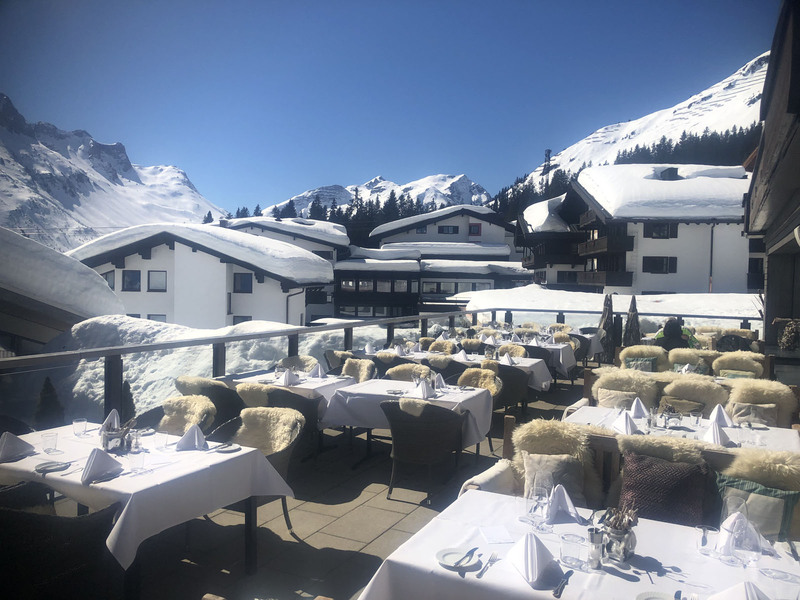 Feast on traditional Weiner Schnitzel, Goulash soup and dumplings, outside on a scenic wooden sun terrace or inside by a cozy fire. 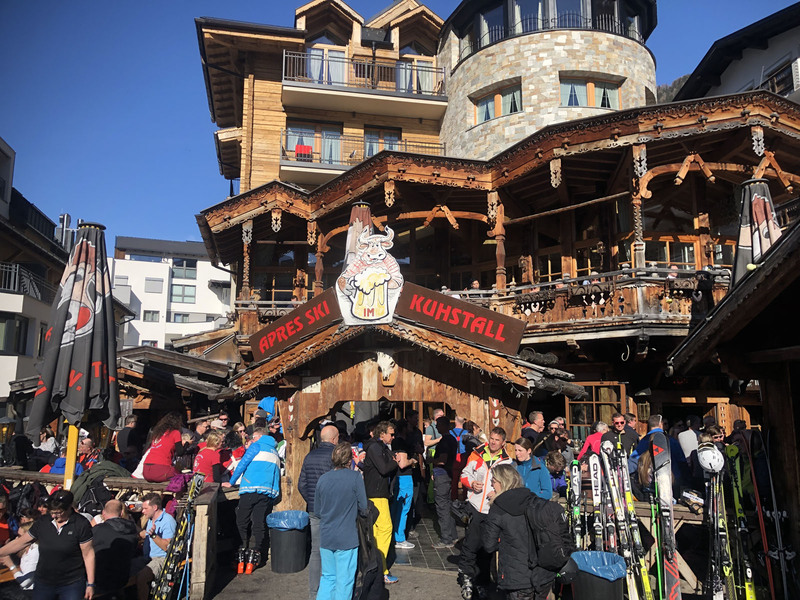 Don’t be surprised if the proprietor brings a shot of homespun schnapps – claiming it’s a “necessary digestive” to aid your skiing. 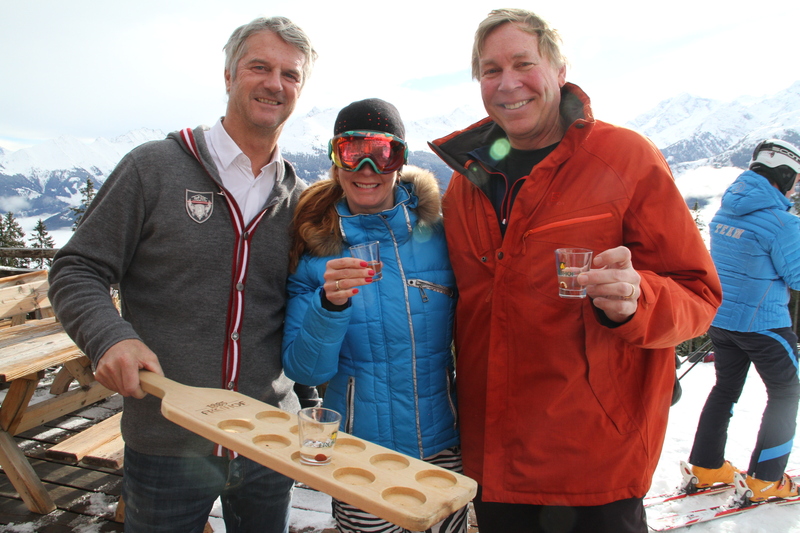 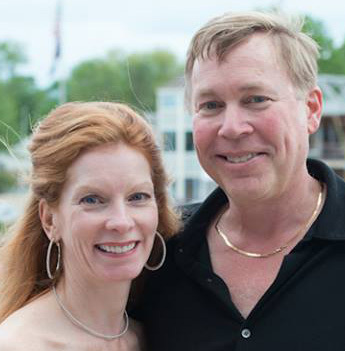 Who’s going to refuse this generations’ old drinking tradition?! 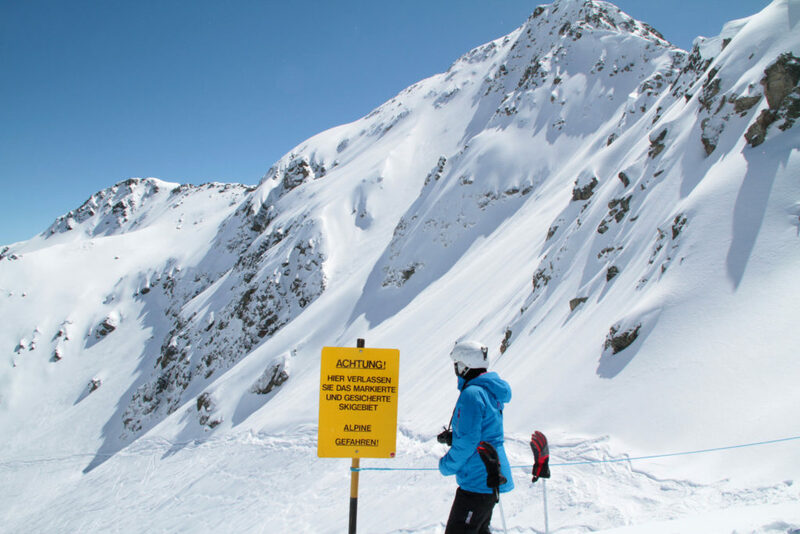 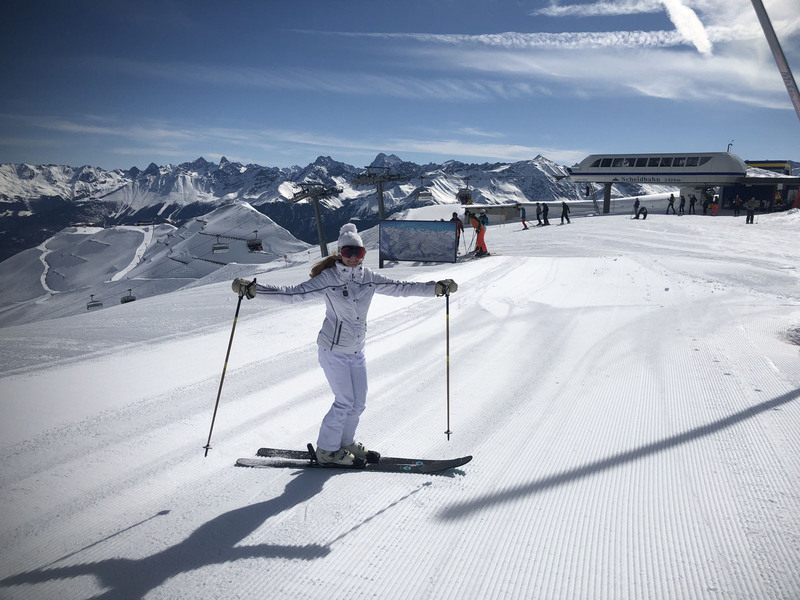 Lit tickets are often under $50, $43/ day at Ski Juwel in the Tyrol buys you 47 lifts, 90 miles of groomed ski trails. 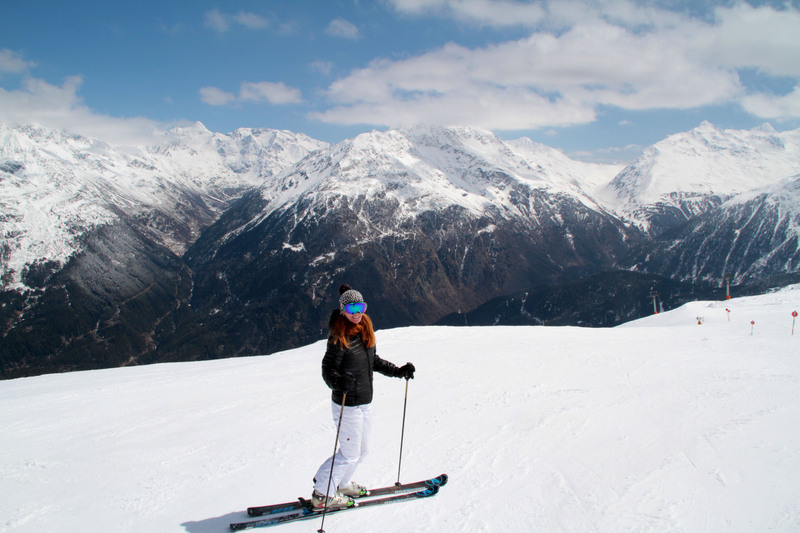 Regional passes include multiple ski resorts, the Zillertal Superskipass, Snowcard Tyrol, and the Olympic SkiWorld Pass of Innsbruck. Austrian tickets systems are electronic RD cards, also valid on the efficient bus systems if you ski off-piste and find yourself in a nearby town you can hop a bus. 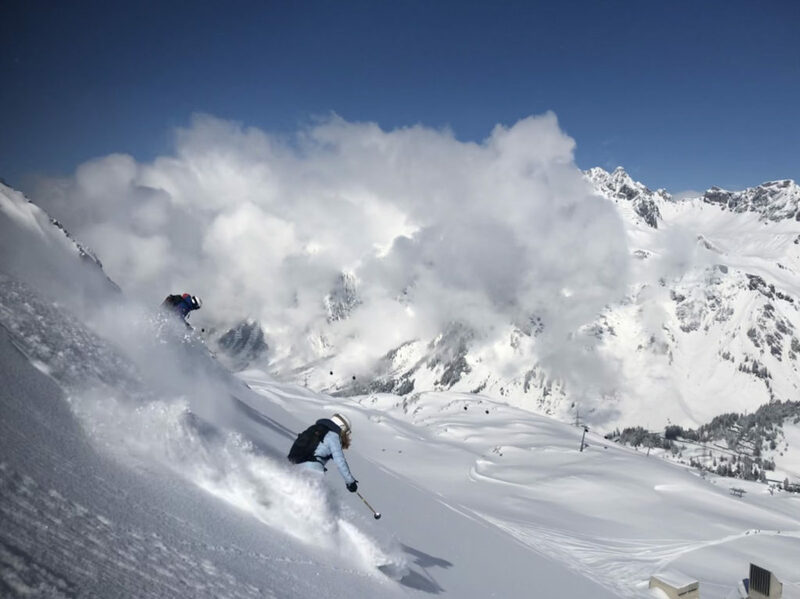 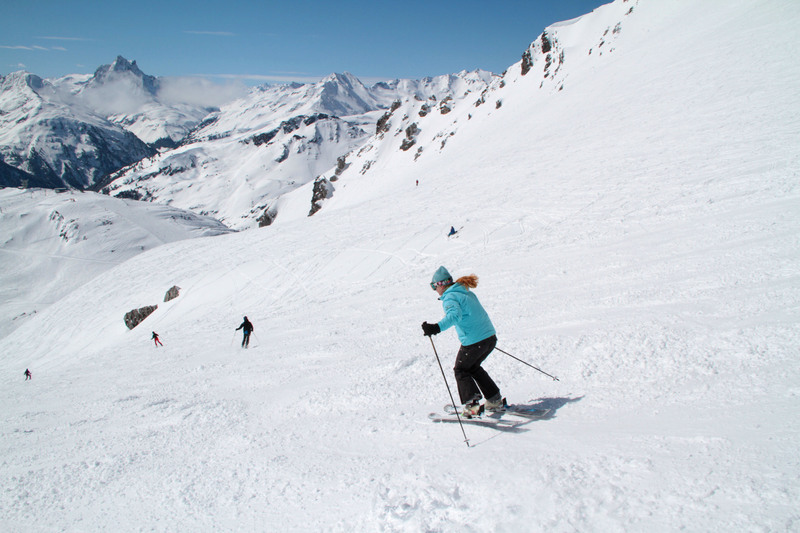 See our Guide to Skiing the Alps. 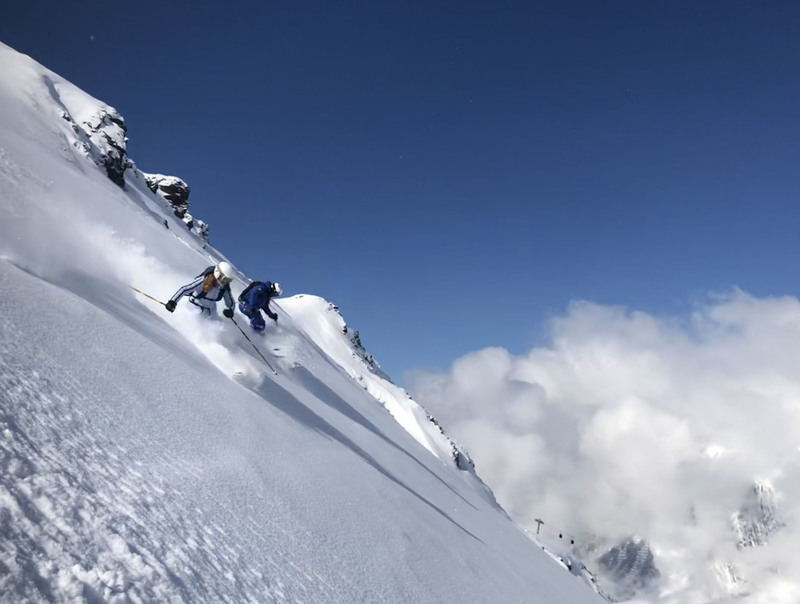 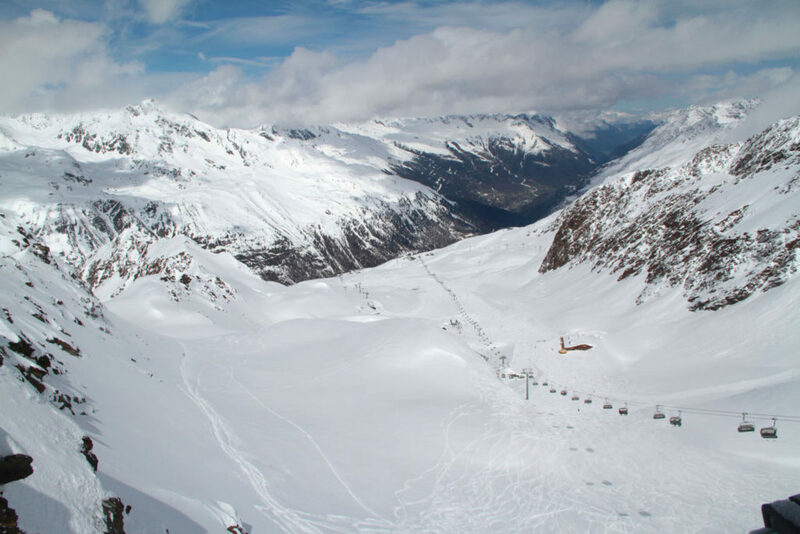 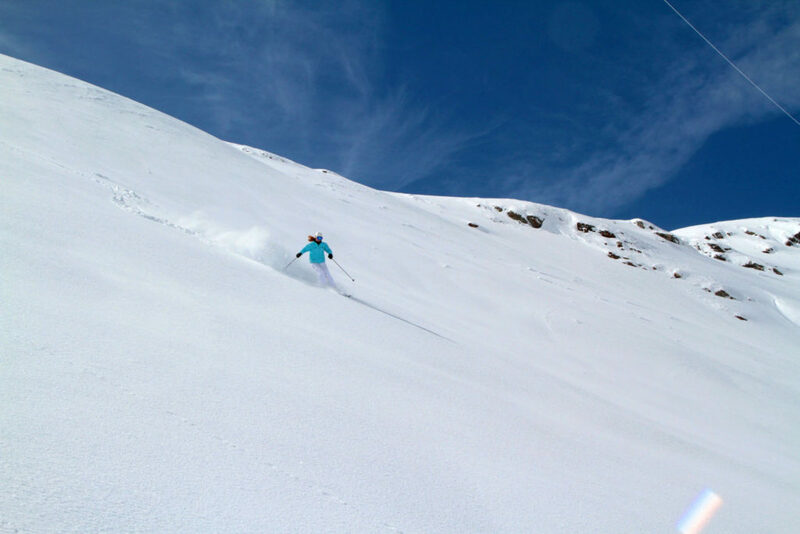 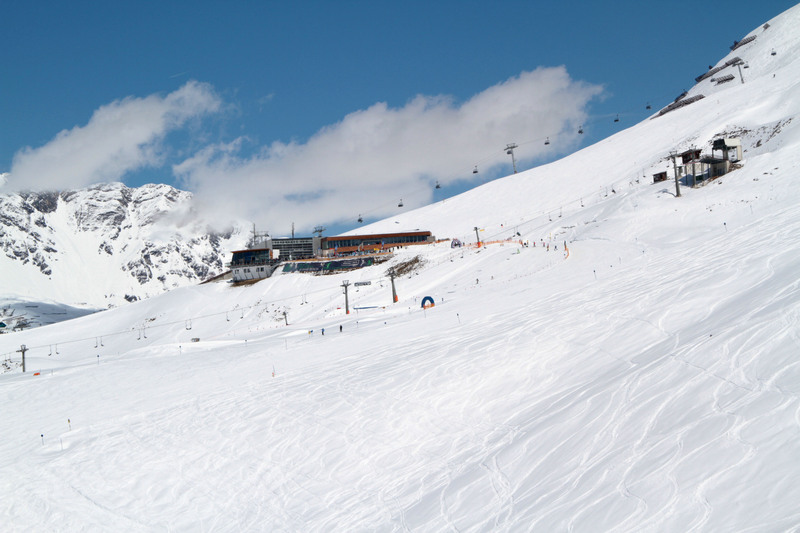 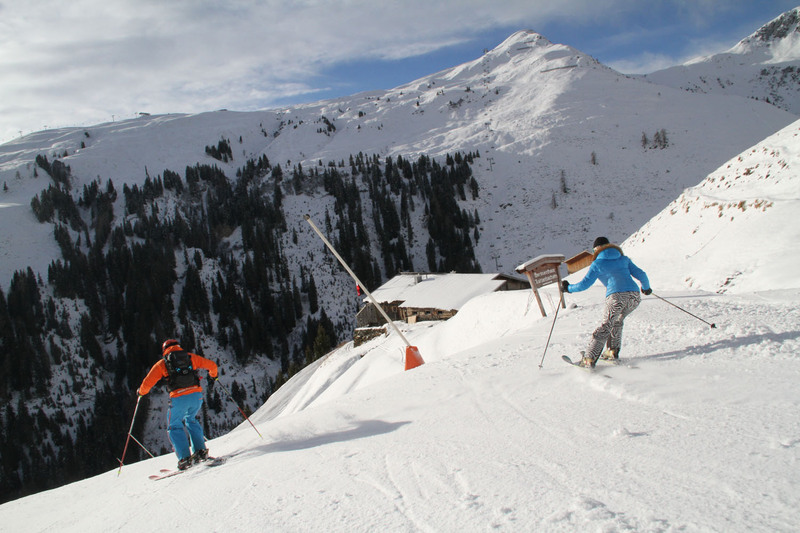 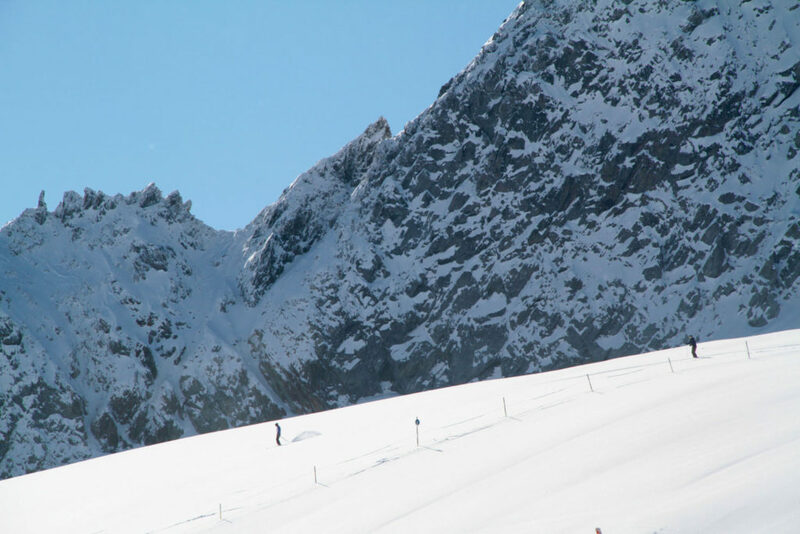 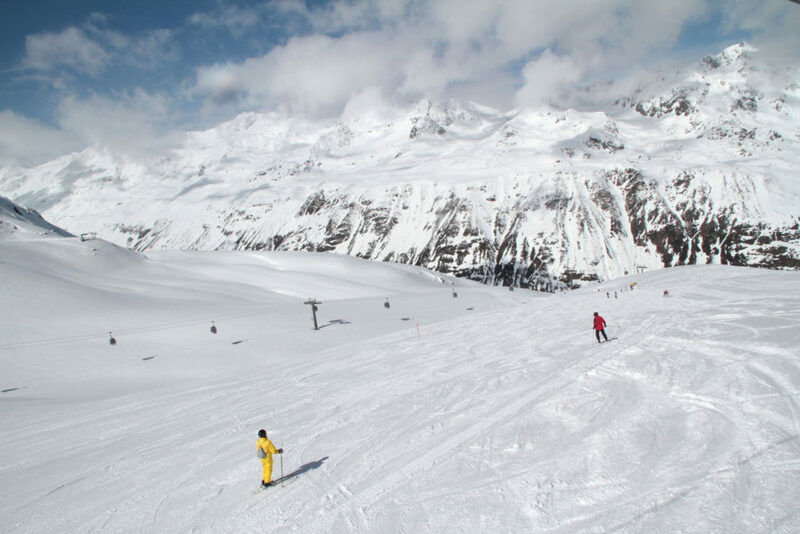 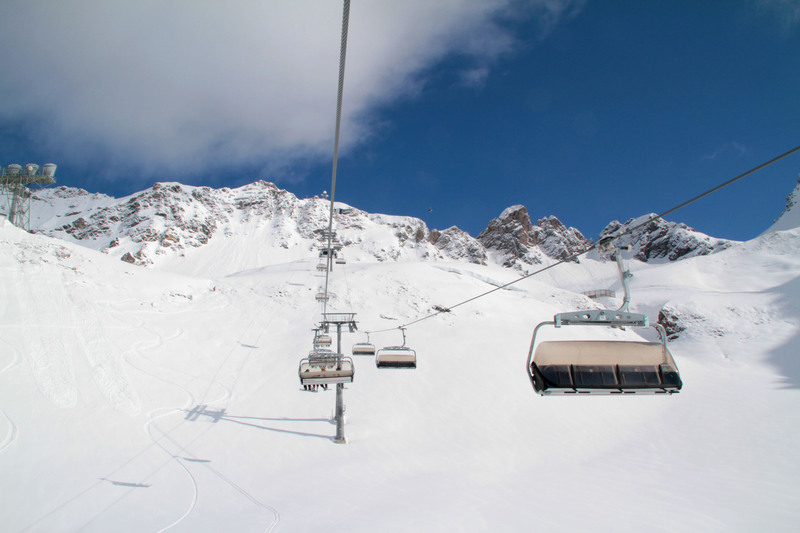 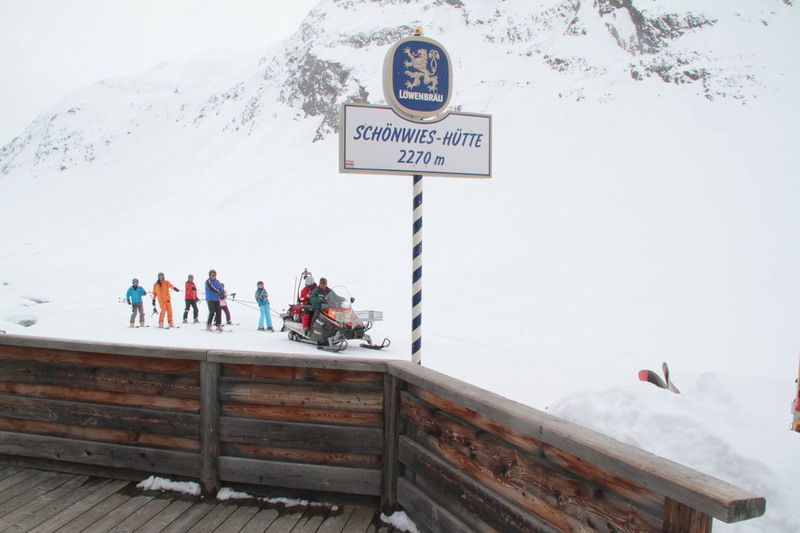 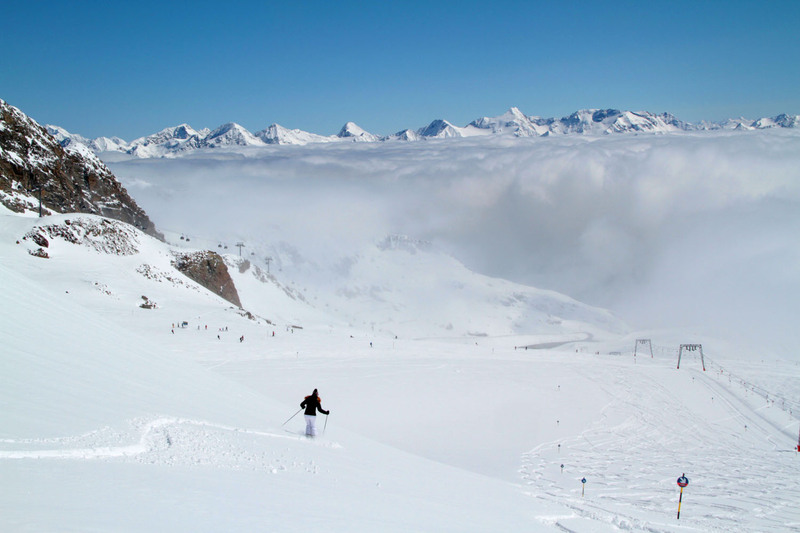 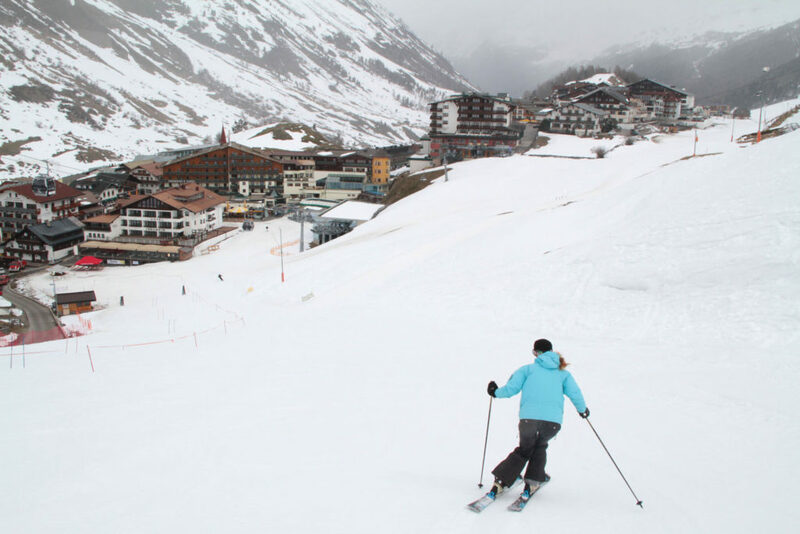 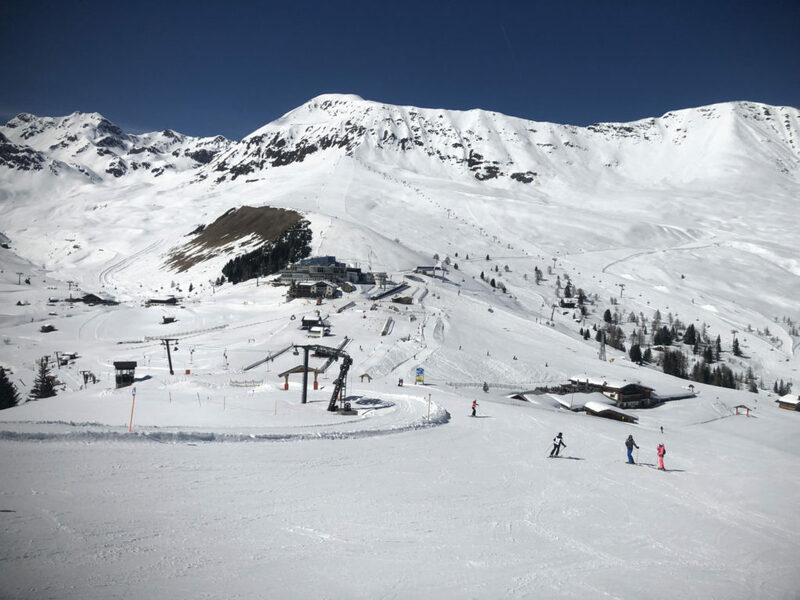 Austria has gorgeous glacier skiing, in fact Hintertux Glacier is open for skiing 365. 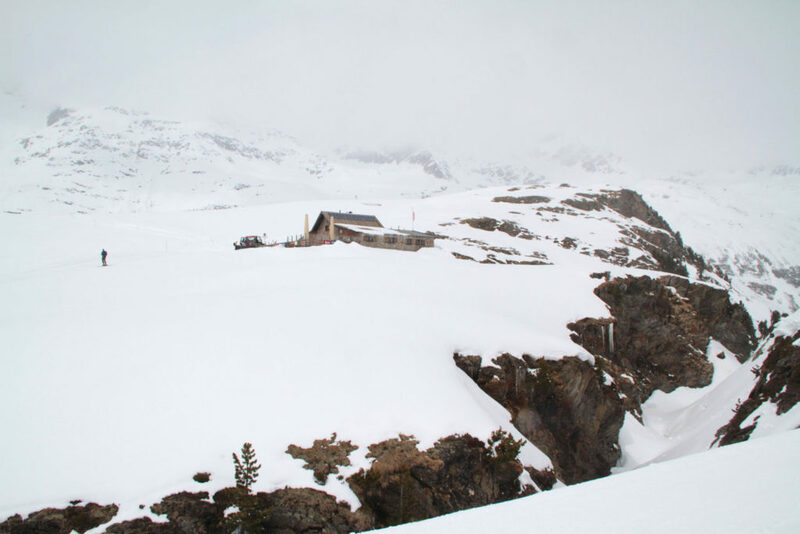 This fascinating glacier at 10,662-feet is training ground for 57 national ski teams in the off-season. 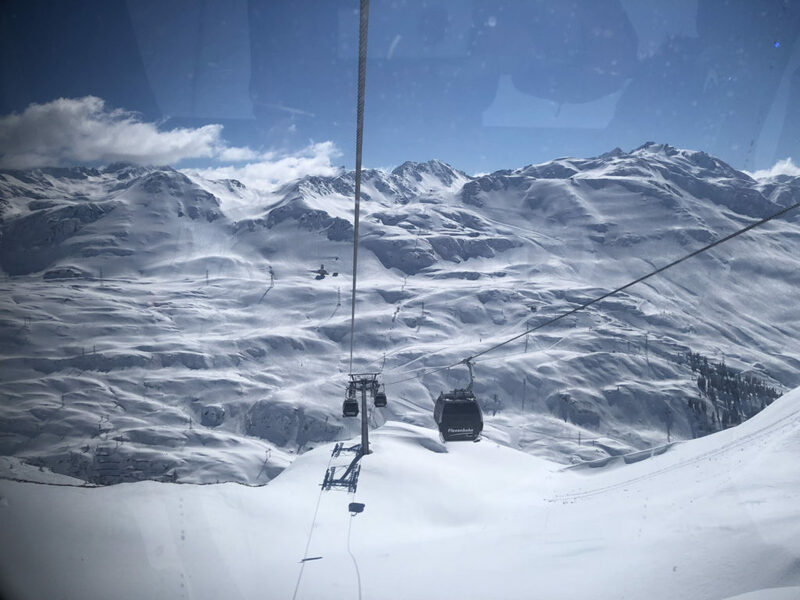 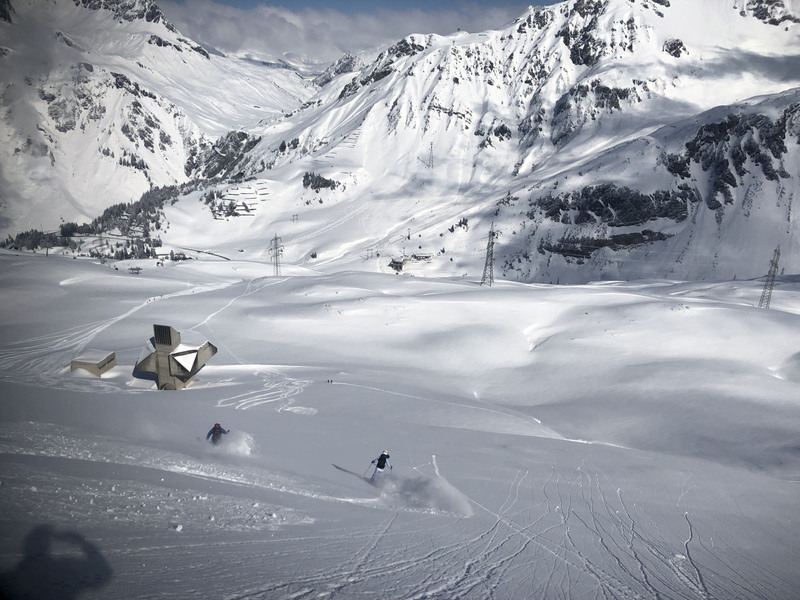 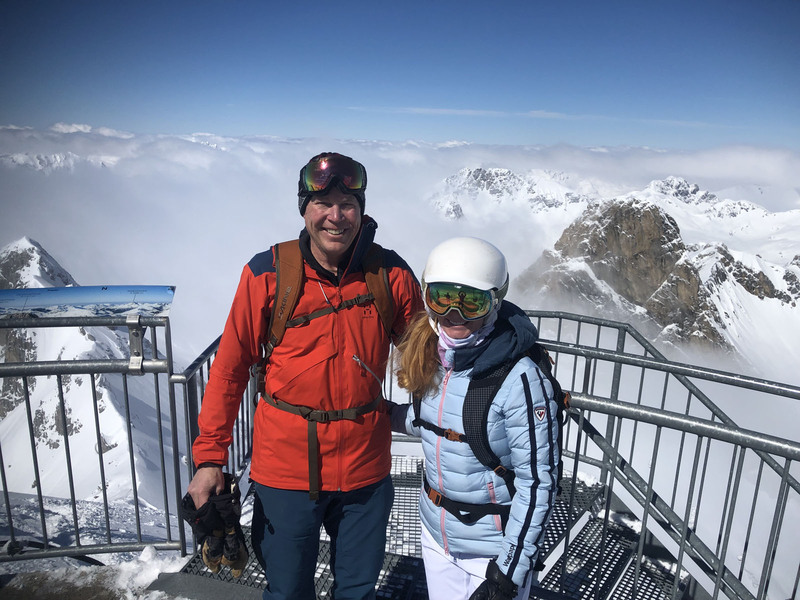 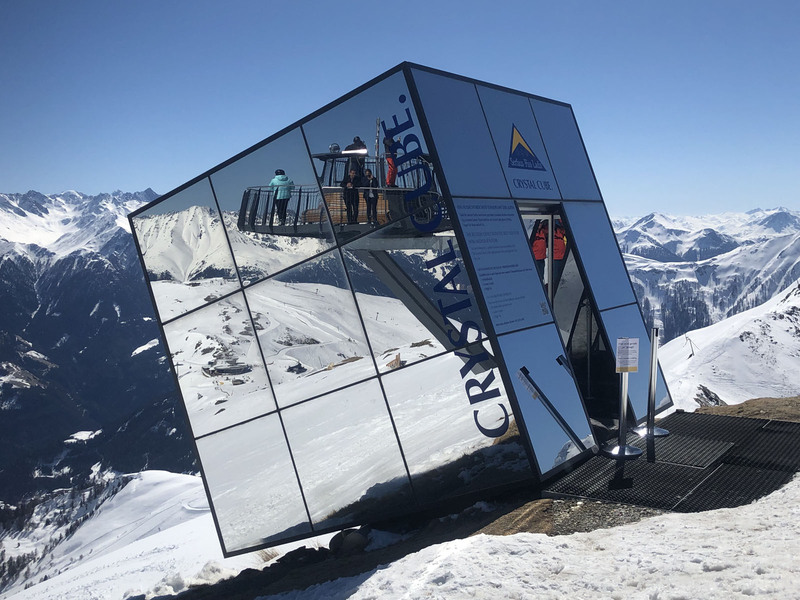 You can actually walk inside the Hintertux Glacier to explore ice caves, frozen waterfalls and stalactites, and take a boat ride on the underground glacial lake 100-feet below the ski slopes. 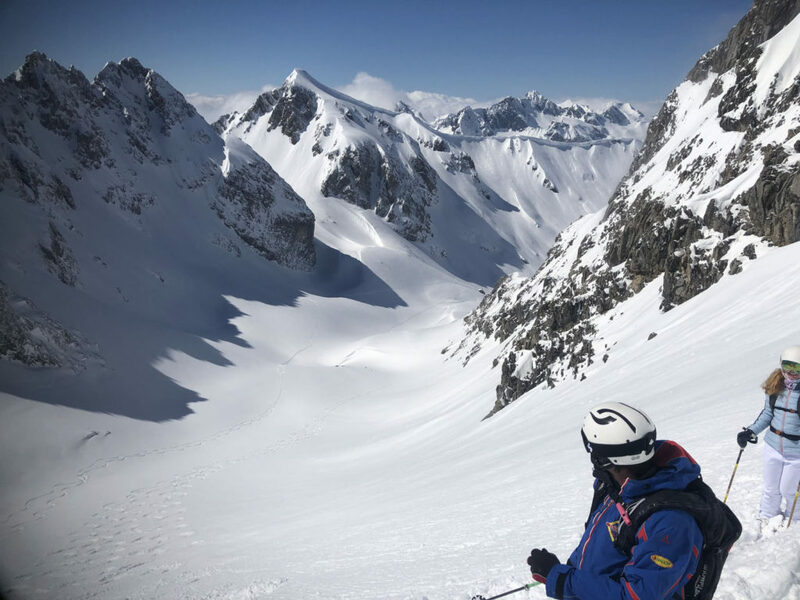 Stubaier Glacier outside of Innsbruck offers real big mountain skiing, a long 4,790-vertical feet down from the 10,531-foot summit. 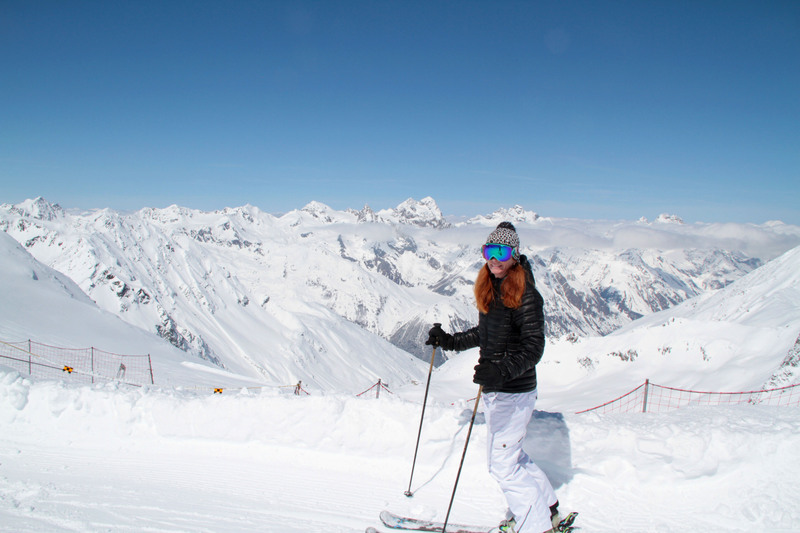 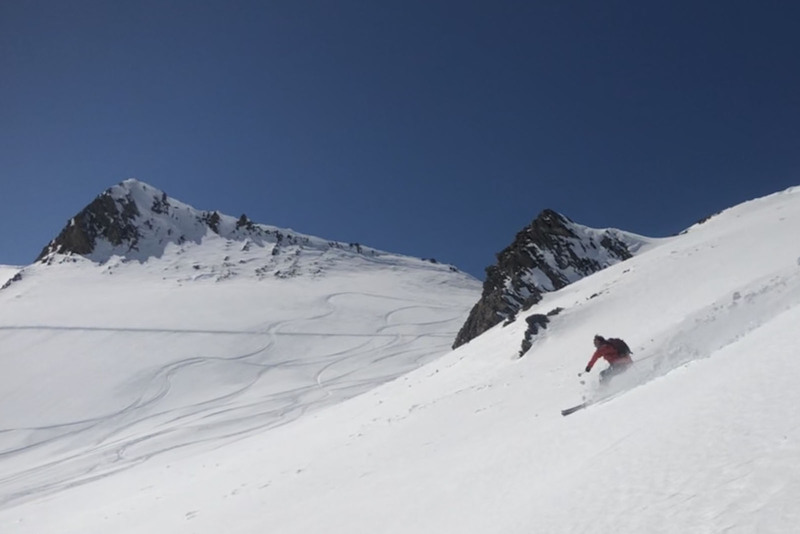 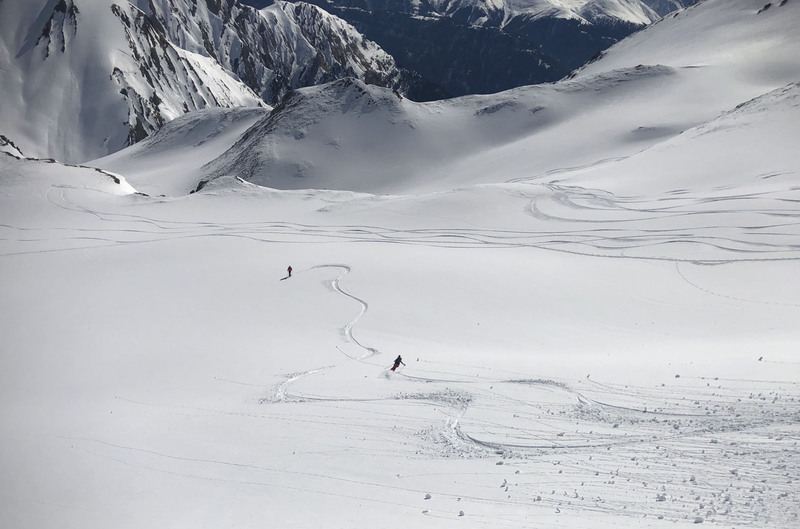 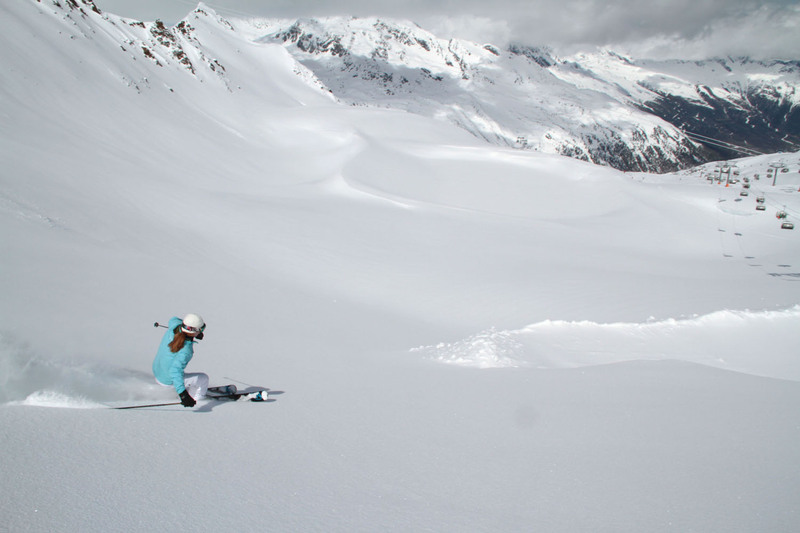 To say Austria’s glacier skiing is cool, well – there I said it. 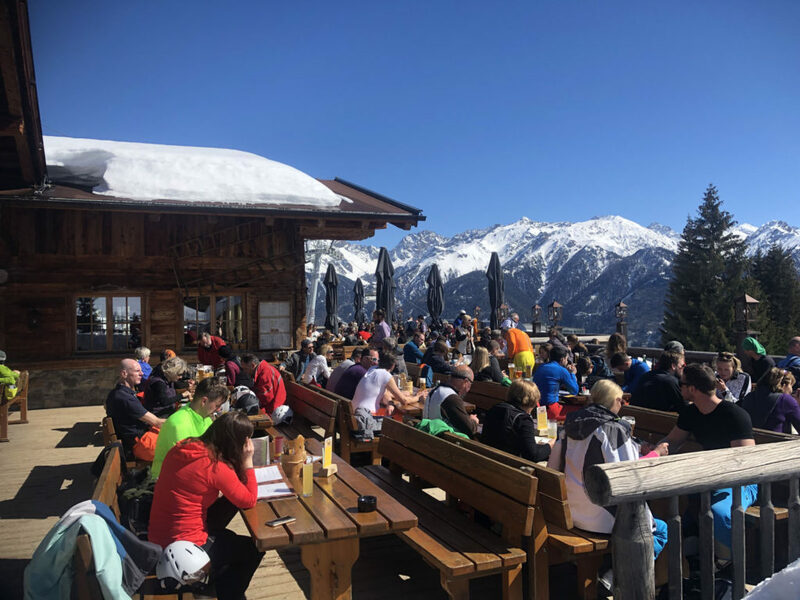 Igloos are constructed on mountaintops annually at Mayrhofen in the Zillertal valley and Nordkette in Innsbruck where you can savor fondue on furskin by candlelight or just chill at the Ice Bar over schnapps. 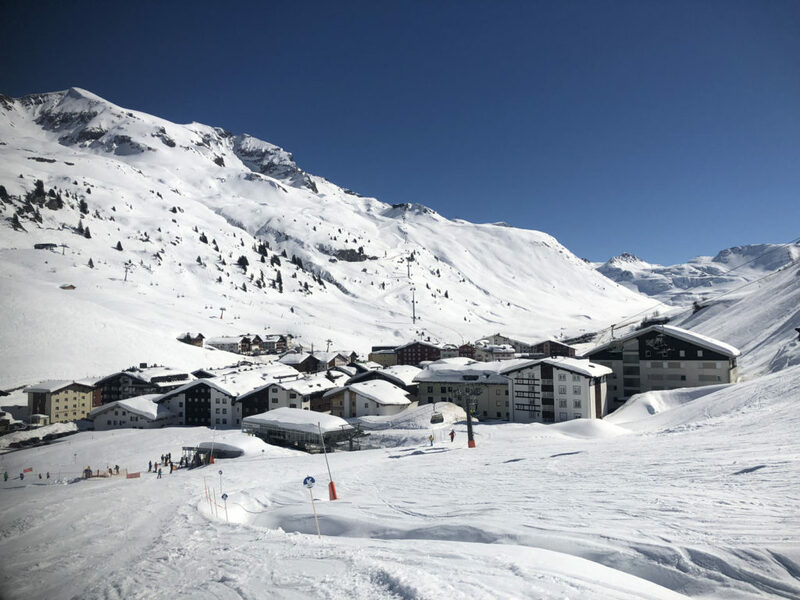 Postcard perfect chalets with wood carved snow-laden roofs await you at the base of vast terrain, with beds covered in the fluffiest of down duvets. 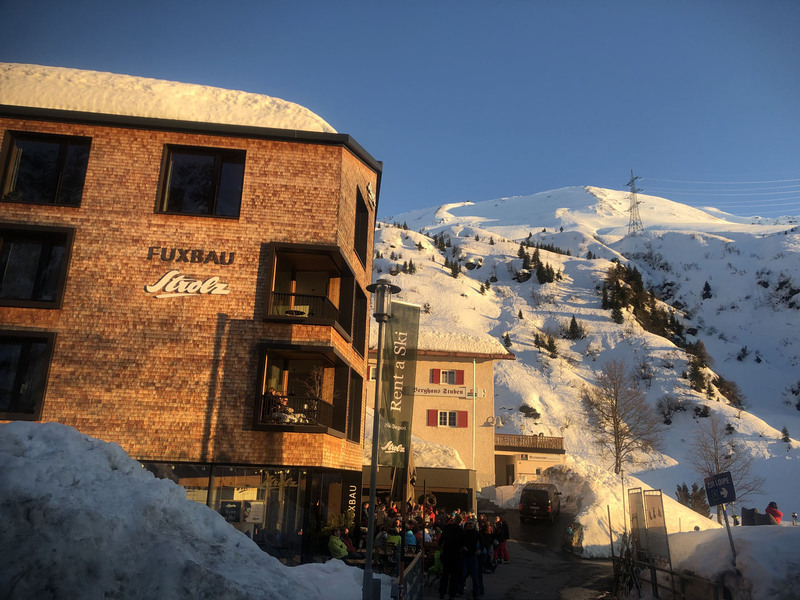 Every place we stayed had a ski room with boot dryers, a convivial bar for après ski drinks by a fire, and half board which includes a hearty buffet breakfast and multi-course dinner with your room rate. 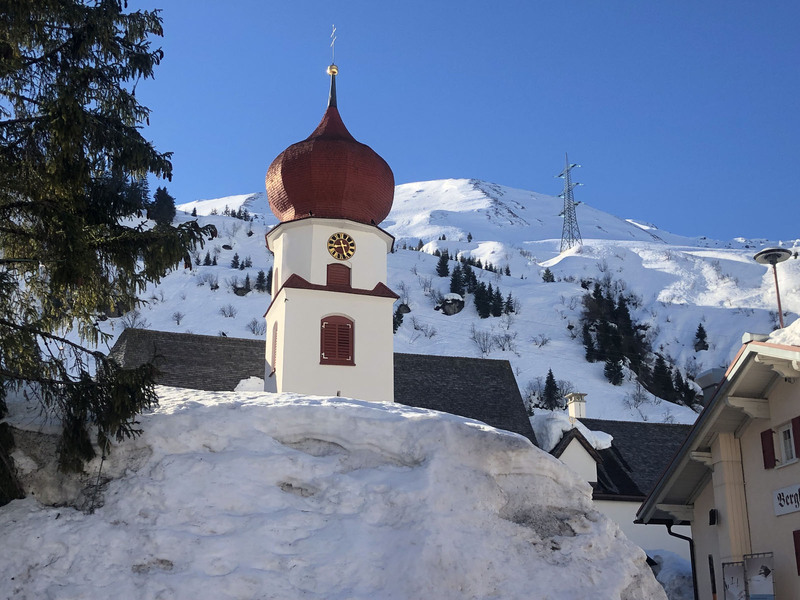 Austrians are very proud hoteliers, typically family members are present and working, and pictures of their generations line the hallways (next to Jesus). 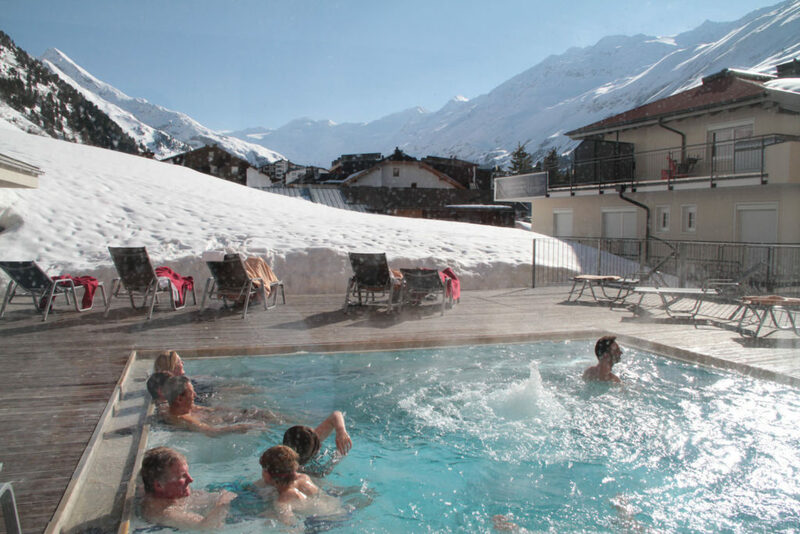 See our favorite Top Alps ski hotels. 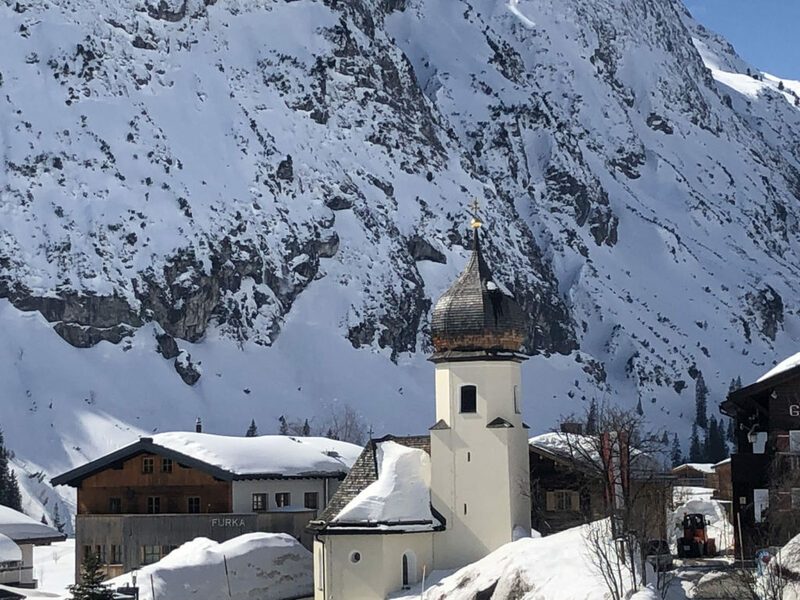 The ski villages of Austria are beyond quaint. 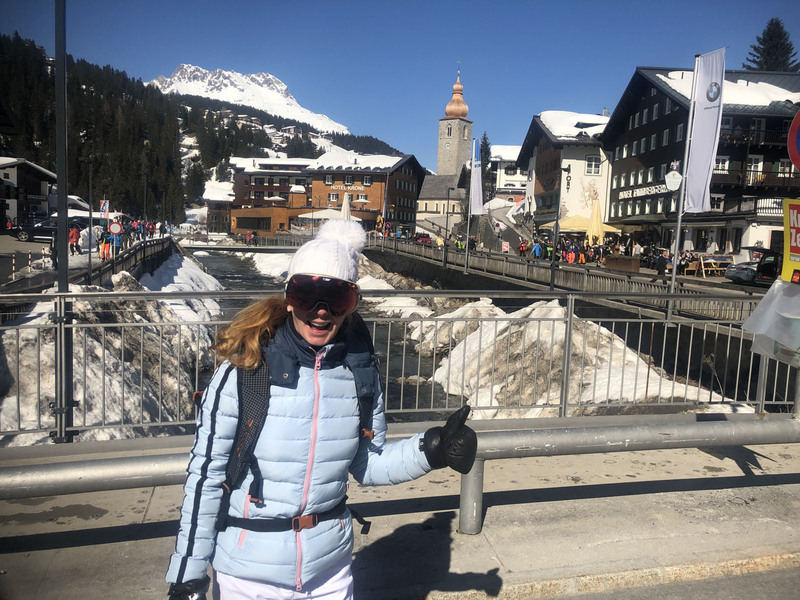 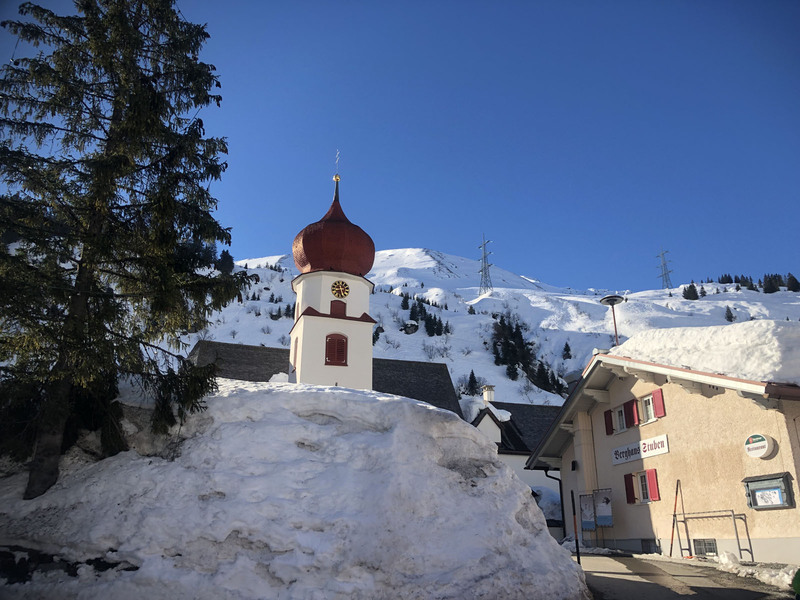 Kitzbühel is a medieval mountain town, so charming from the church bells and cobblestone streets (not so easy in ski boots), to the artwork depicting the first skiing in 1893 – when Franz Reisch descended the Kitzbüheler Horn. 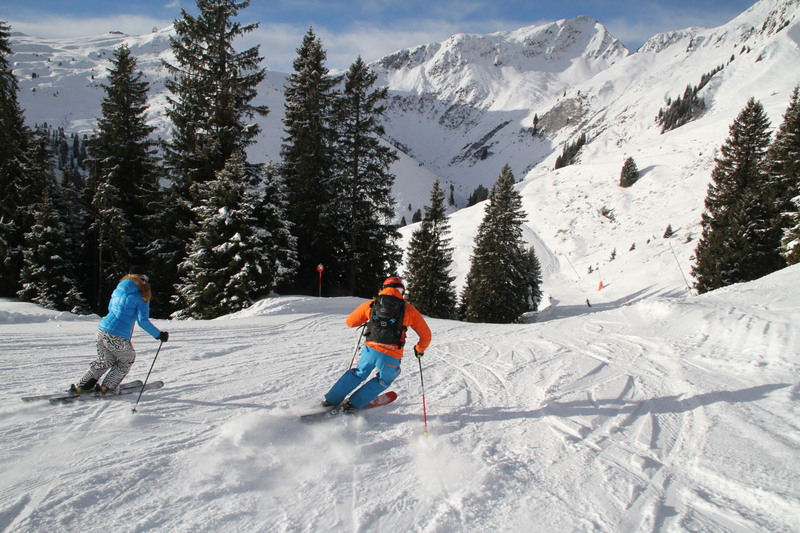 St Anton is the cradle of alpine skiing – visit The Museum and don’t miss the Ski Show. 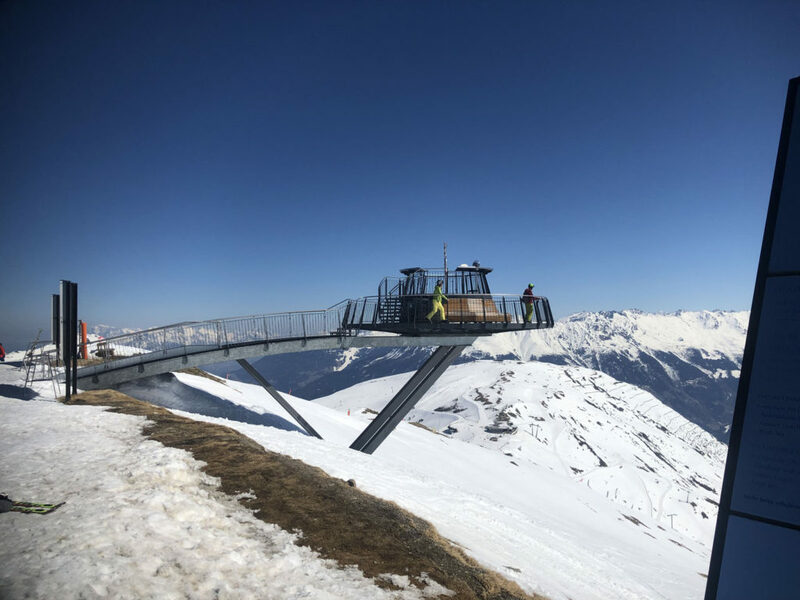 Innsbruck has 15th century palaces just steps from modern ski lifts to Nordkette – the steep ski area overlooking this beautiful City of the Alps. 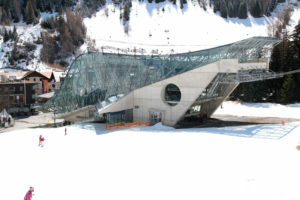 Innsbruck has nine ski areas in a 40 minute radius where Olympic ski events were held in 1976 and ‘64. 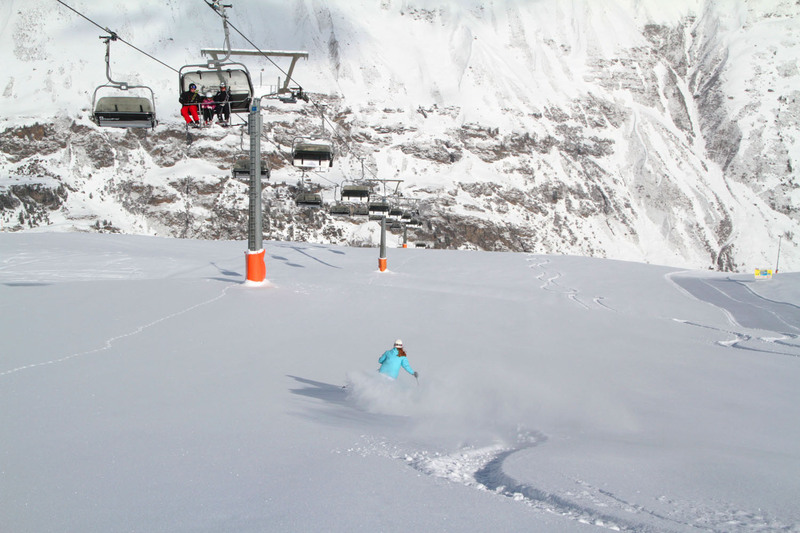 Skiing doesn’t start and stop at first tracks and last chair in Austria. 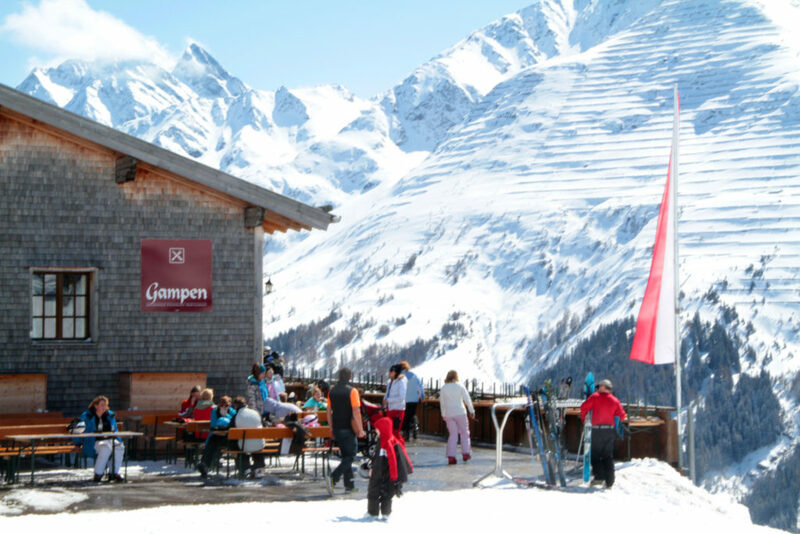 Après ski starts at lunch with schnapps and gluehwein, and pours well into the evening. 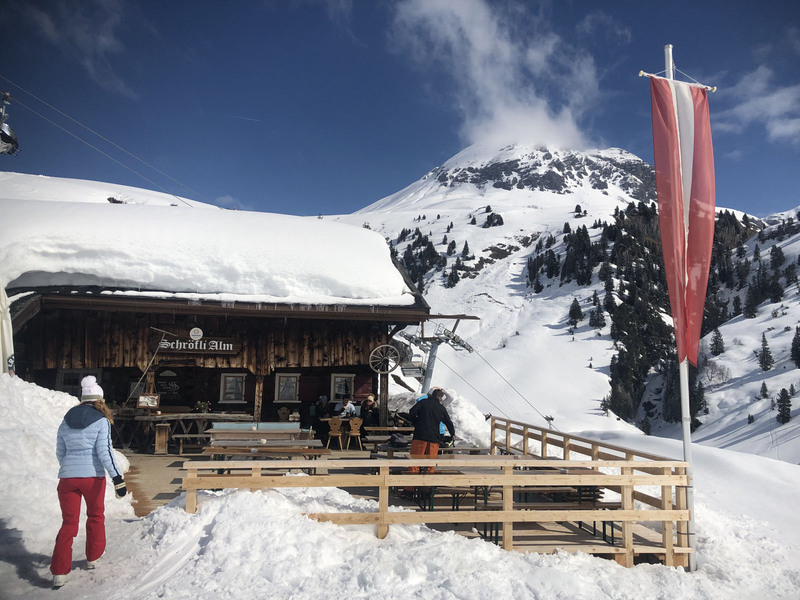 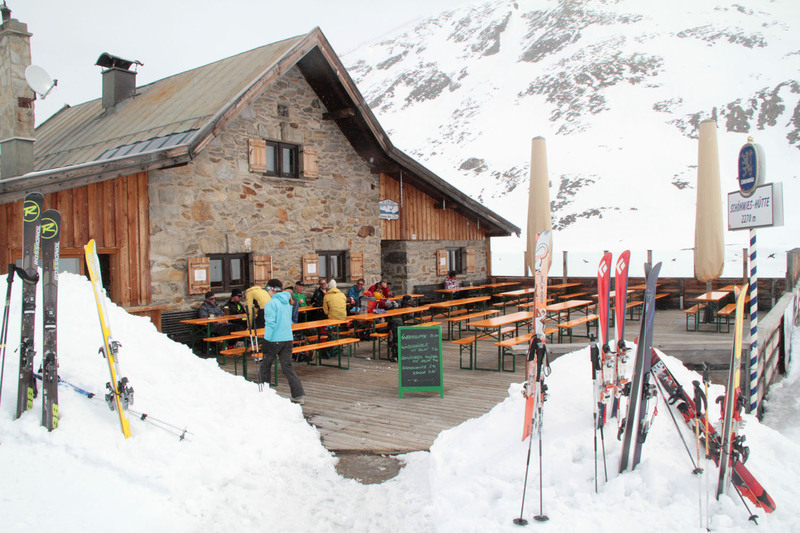 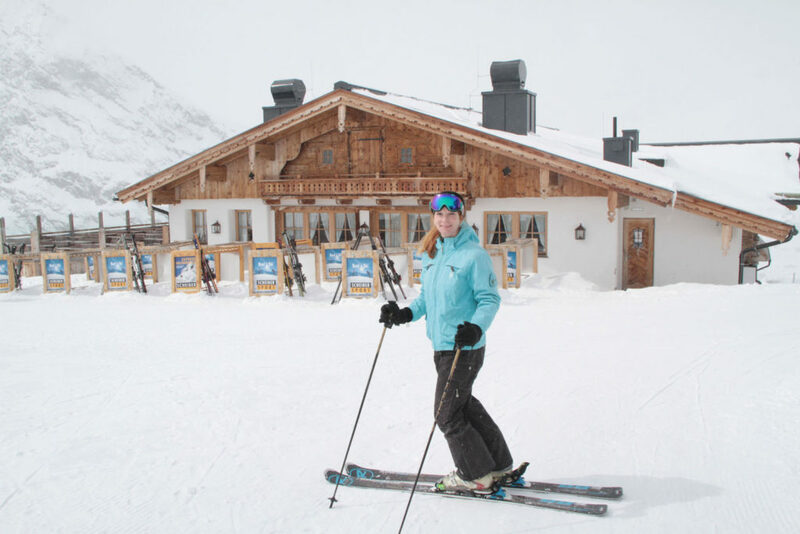 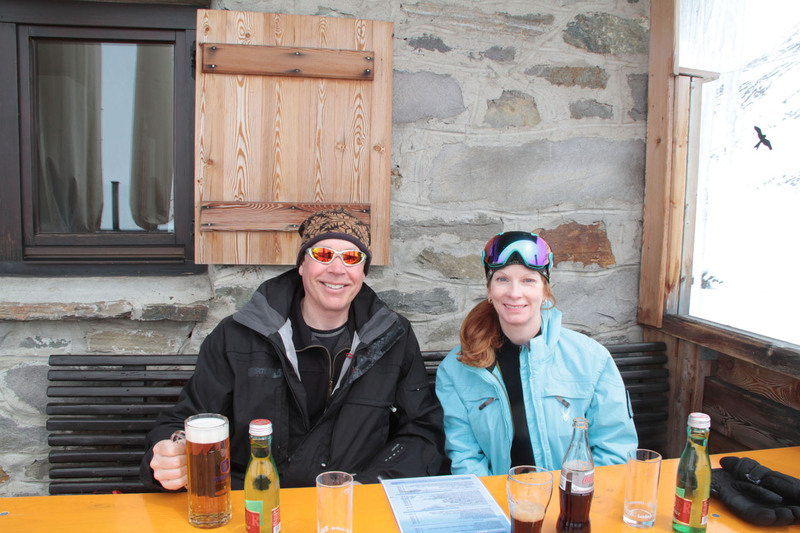 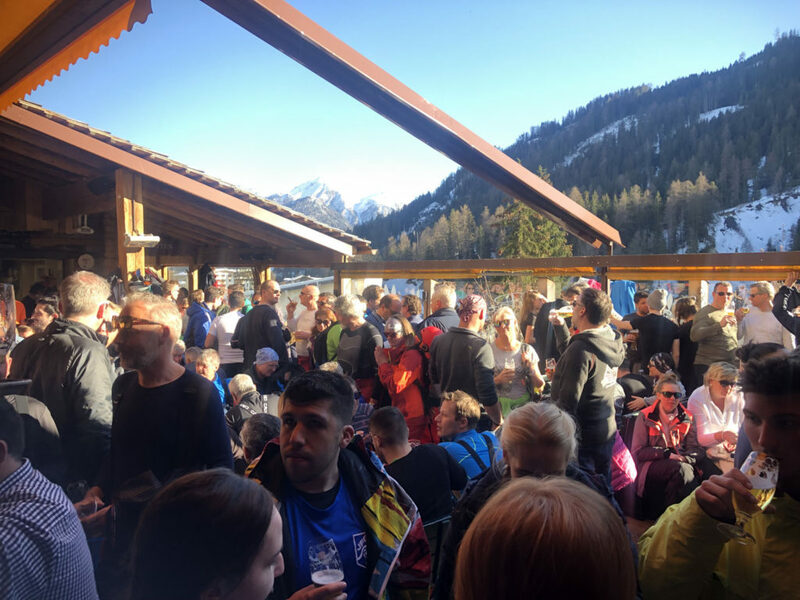 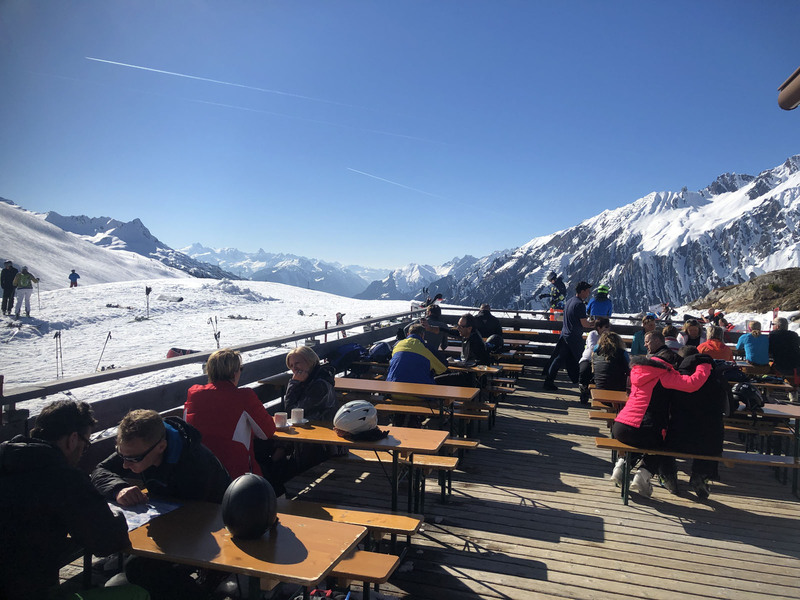 You can leave your ski boots on, even dance on the tables at St Anton’s Mooserwirt or Serfaus Patchi Bar. 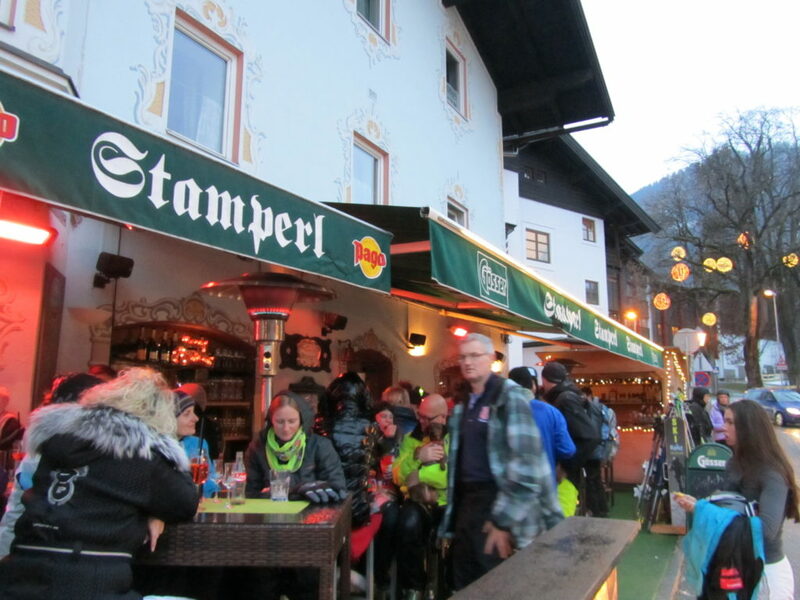 The guy dressed as a Polar Bear at Mayrhofen’s Ice Bar wanted to dance with me, and I felt like the weirdo. 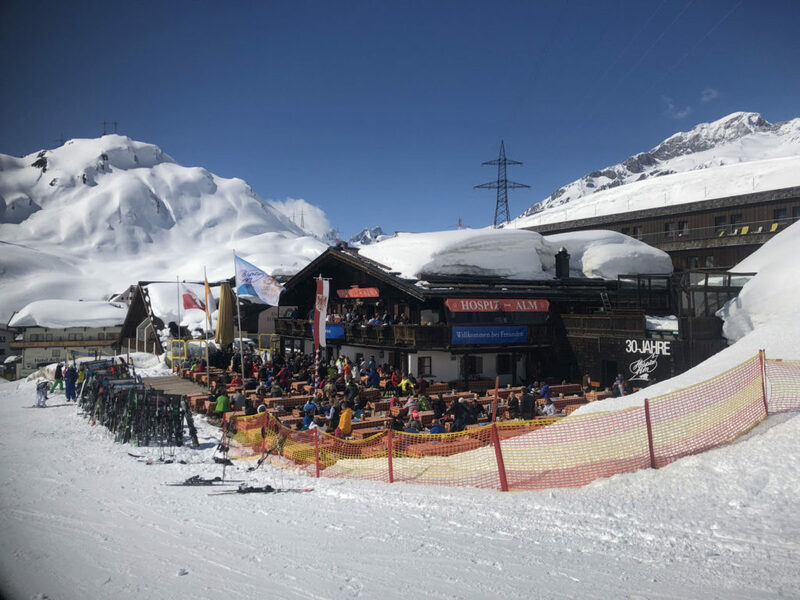 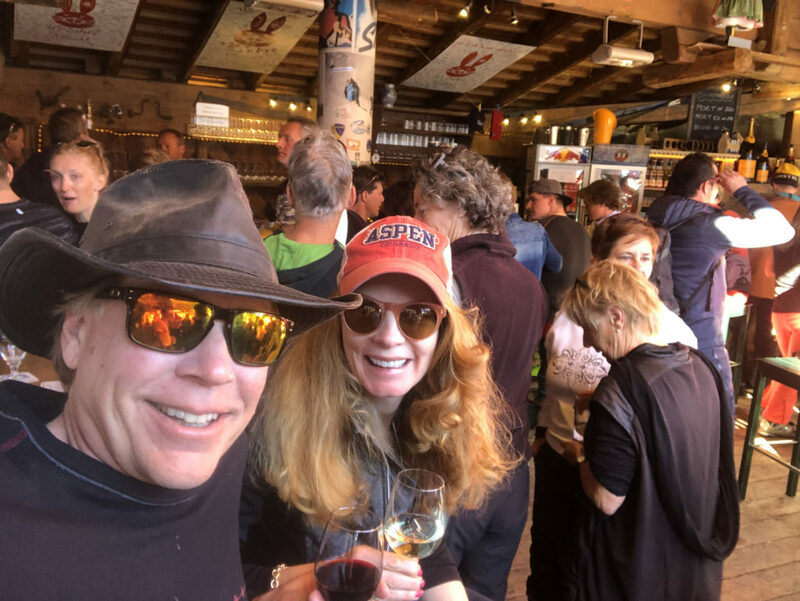 Ischgl is the après ski capital of Austria with crazy bars named cow stall – Kuhstall and witch – Hexen. 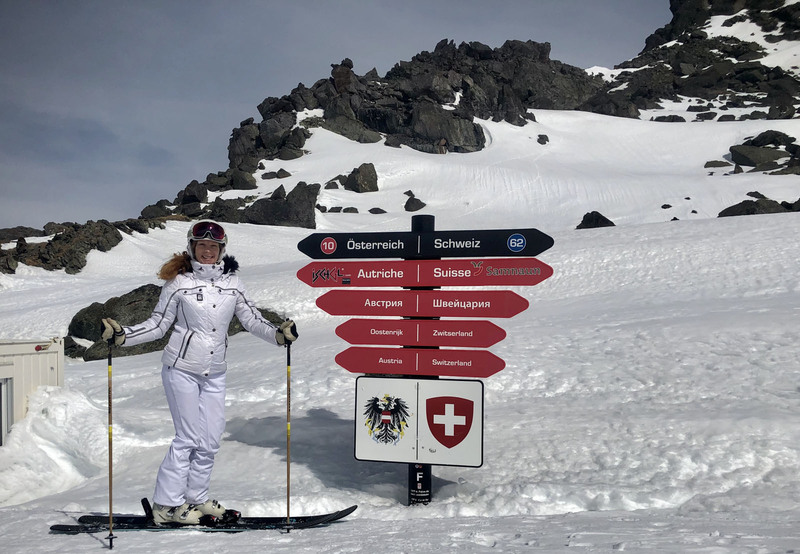 Why not Austria? 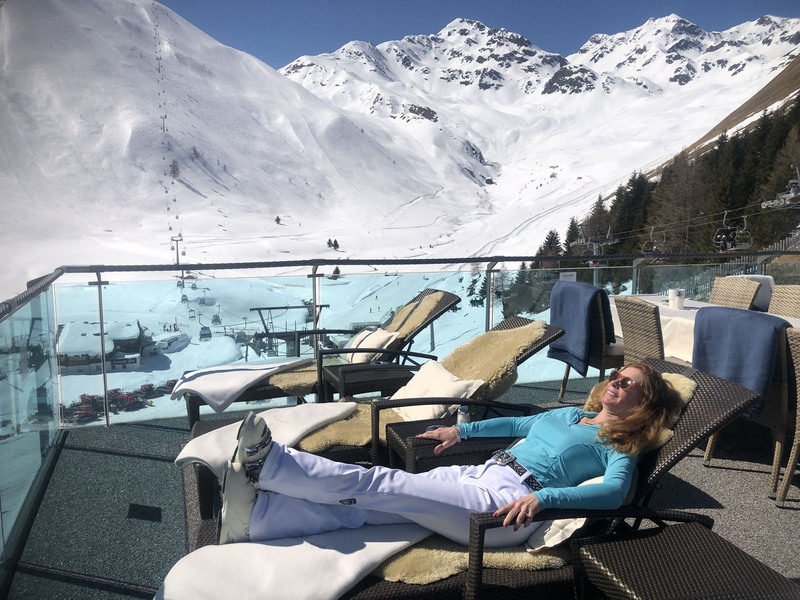 Several Austrians asked me why Americans have stopped going to the Alps for skiing. 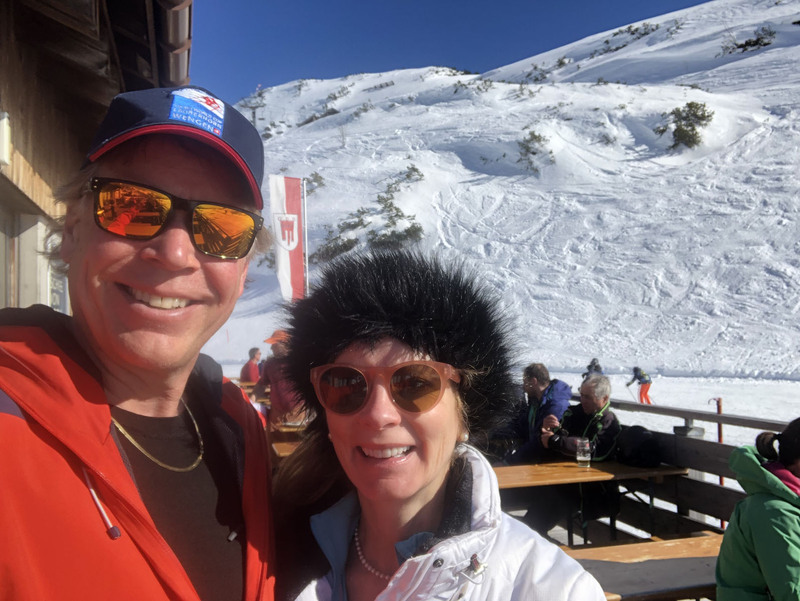 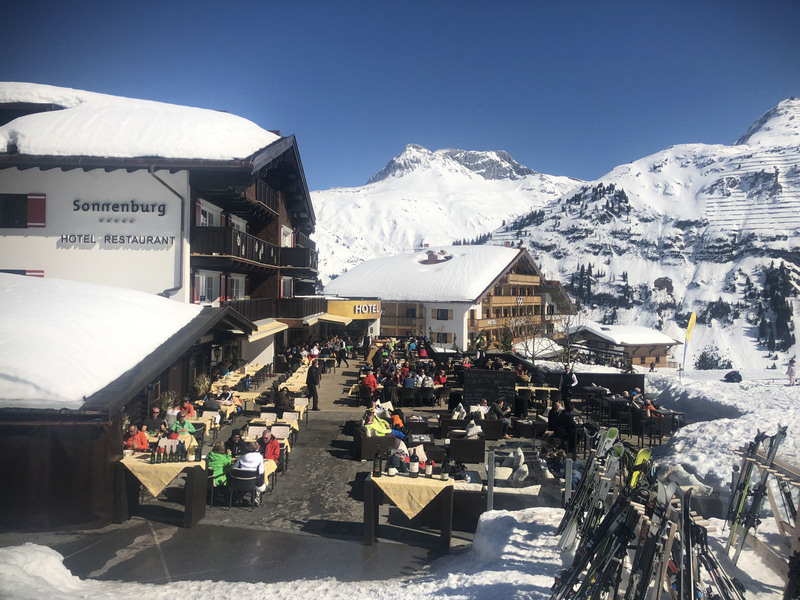 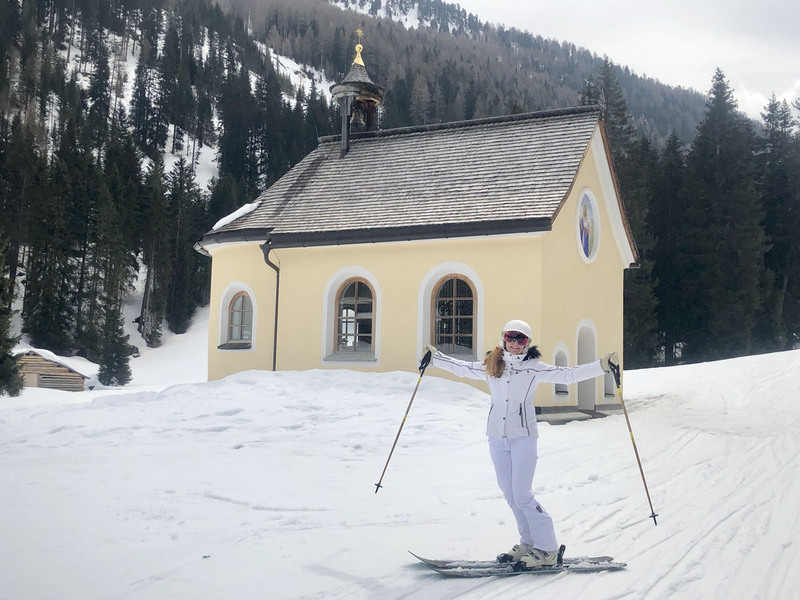 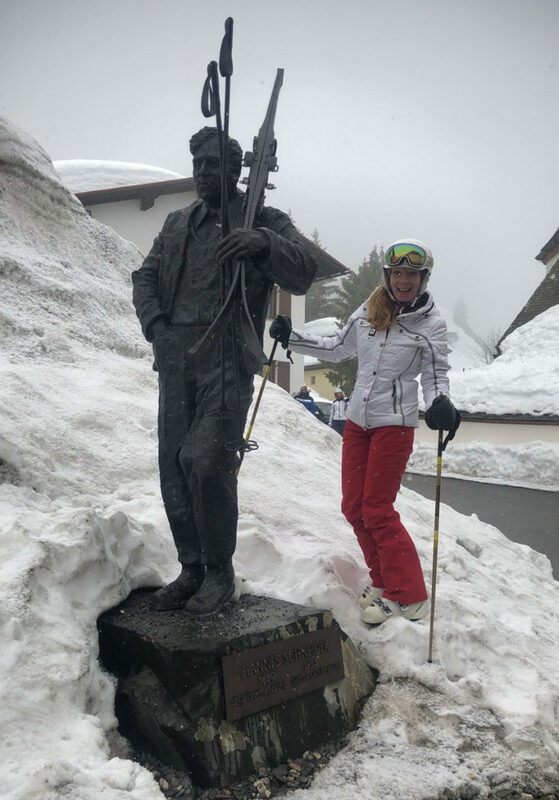 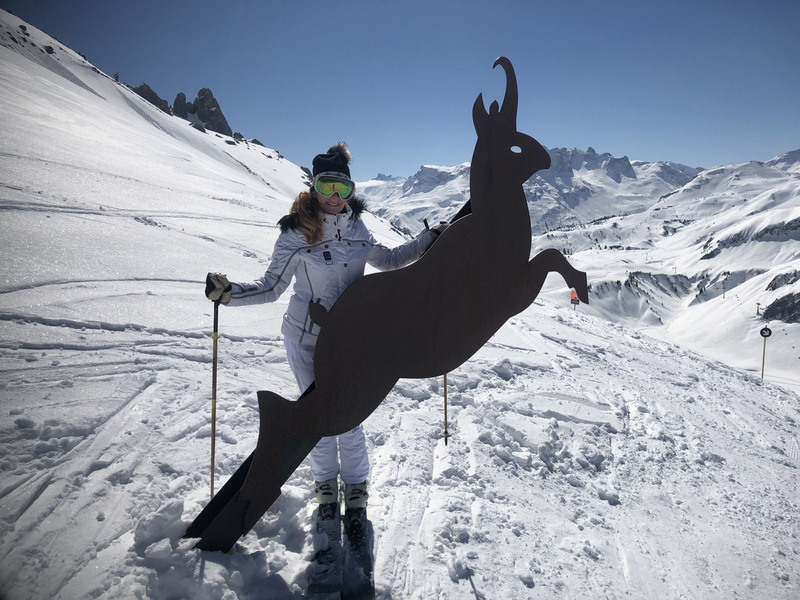 With our US dollar comparable to the EU, and all this amazing skiing, I struggled to offer a satisfactory answer, and instead toasted their hospitality with another schnapps.